An absolutely incredible win for the A team at the competition tonight against extremely tough teams. The team scored an amazing 229 points, putting them SECOND in the league!! Every member of the team should be extremely proud of themselves for putting in such a brilliant performance and for showing excellent team spirit and support throughout the evening. We are now looking forward to the final competition in the league and finding out where we finish. 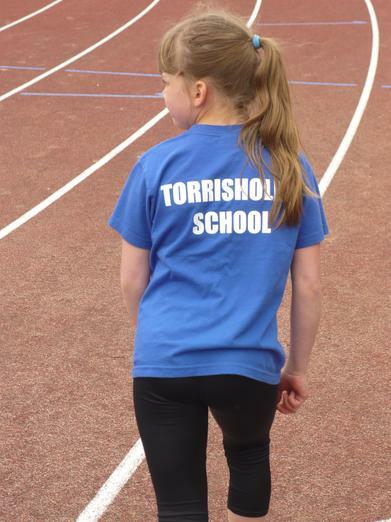 Come on team Torrisholme!! 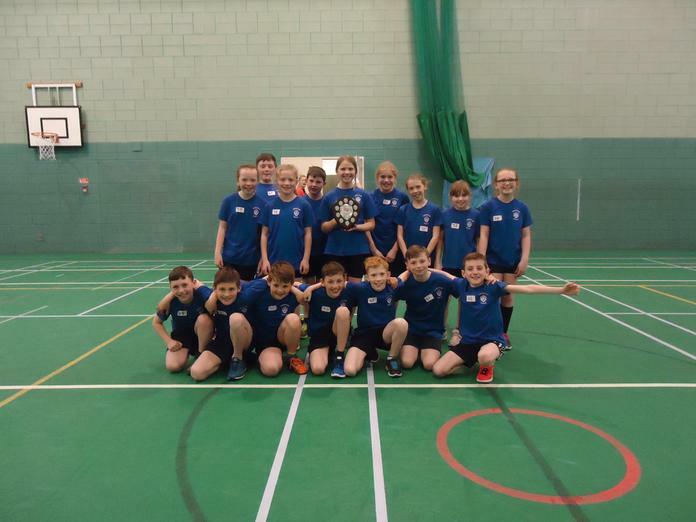 B Team Athletics Team Friday 1st February. 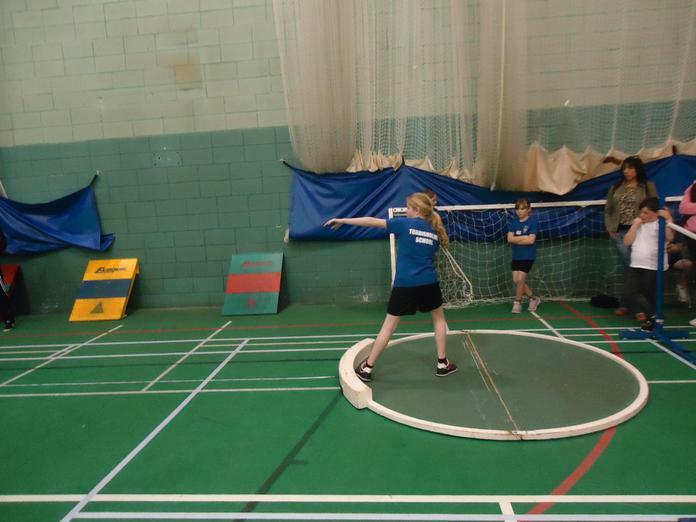 As always, the team were an absolute credit to Torrisholme School. They supported each other brilliantly throughout the evening which was wonderful to see. They all performed really well, putting in 100% effort against extremely tough competition. 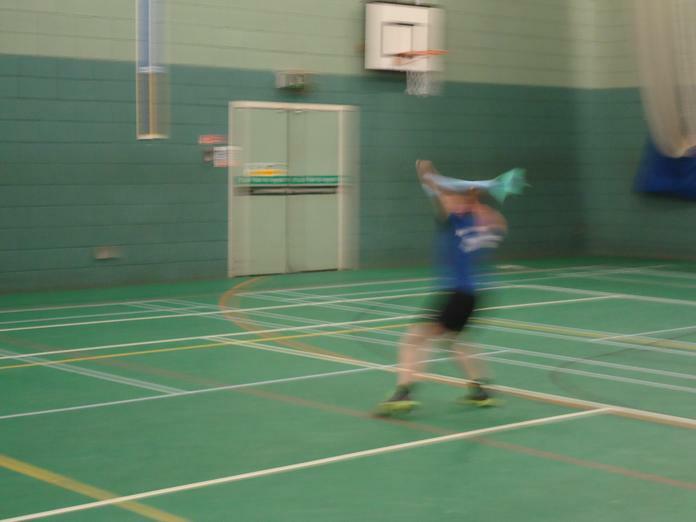 A special mention to Jack Mount who beat his best javelin distance this year by 6 metres! With many of the team making their debut, it was an exciting night! 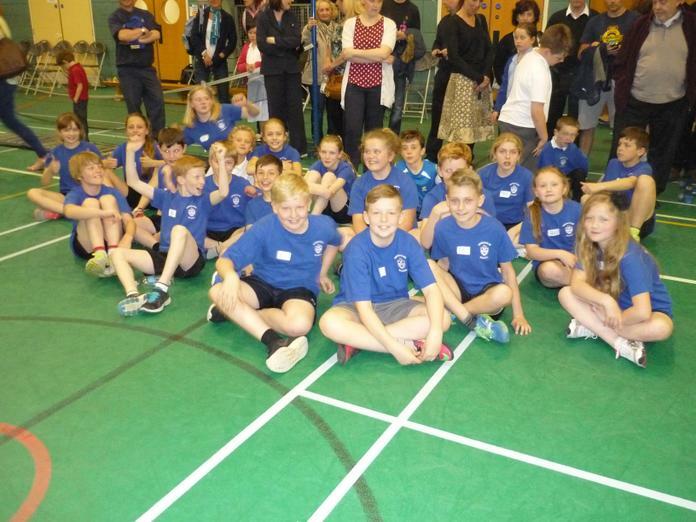 The children represented the school brilliantly, supporting and encouraging each other during every event. 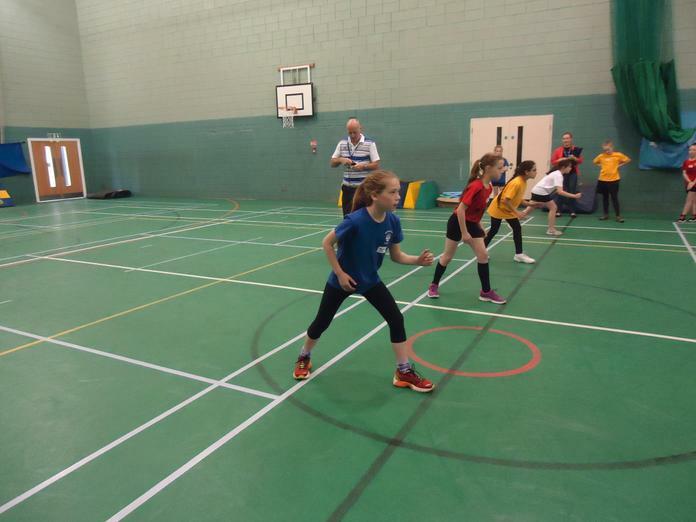 In the girls' team, highlights included Thea taking second place in the speed bounce and third place in the 4 lap race; Erin taking second place in the shot putt and Summer taking third place in both the speed bounce and the long jump. For the boys, Ronnie made a great start, taking first place in both the hurdles and the speed bounce; Joshua H ran like a little rocket to take first place in the 4 lap and second place in the 2 lap; Jack M took third place in the long jump and second in the speed bounce; Charlie was second in the triple jump, Finley took first place in the shot putt and Jack L took third place in the 2 lap - wow! 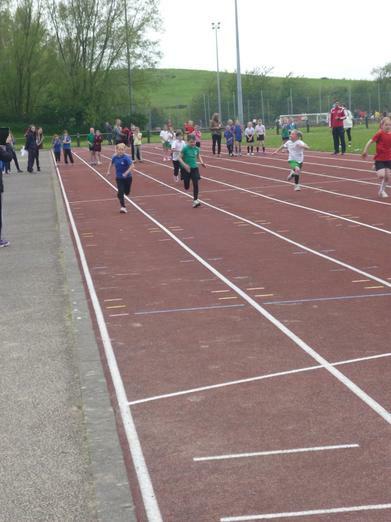 To finish things off, our relay team of Joshua H, Jack L, Eva and Thea came home in first place! The scores were added, leaving Torrisholme in second place overall and us all feeling excited about the next competition! Well done everyone and thank you to all our supporters. What an amazing first competition it was!! 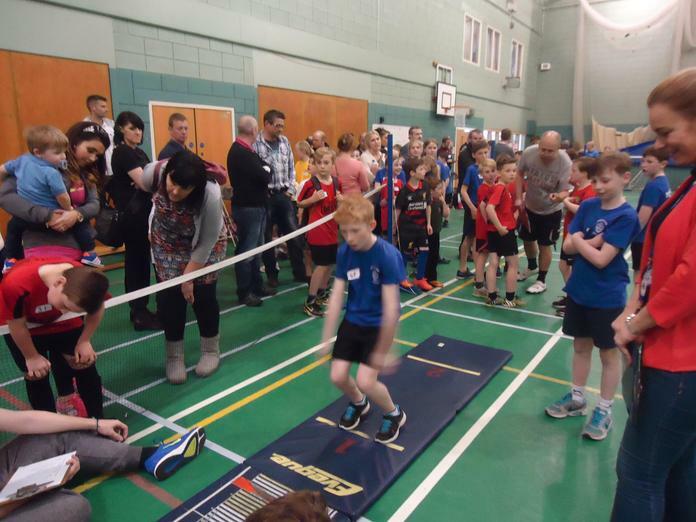 Our team consisted of many children who were experienced, having taken part last year, but a number of brand new competitors. We were extremely proud of the children's team spirit and the way they worked together and encouraged each other, in addition to some of the fantastic performances they put in! Highlights in the boys team included Beau winning the shot put competition with a huge throw of 6.50m, Harry winning the speed bounce competition on his debut with a fabulous 44 bounces, Freddie taking first place in the 4 lap race and triple jump, along with second place in the long jump and Luca taking first place in the 2 lap race and long jump, second place in the hurdles and third place in the speed bounce! On top of all that, Luca's jump of 2.10m in the long jump competition beat the previous school record of 2.08m! What an amazing performance from Luca! 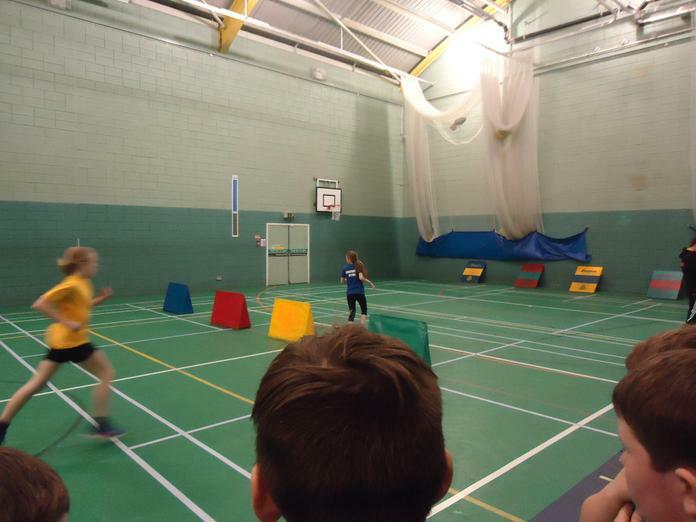 In the girls team, Sylvie took first place in both the 2 lap race and the speed bounce, along with third place in the hurdles, Evie took third place in the 4 lap race and the long jump, whilst Abigail and Keisha took second and third place respectively in the shot put competition! In the final event of the evening, our relay team of Luca, Freddie, Evie and Sylvie ran their socks off to finish in second place! We waited anxiously for the final scores, after the lead had been changing all evening between Torrisholme, Slyne and Bolton-le-Sands. After all the points were calculated... Torrisholme took first place!!! A great start to the season, leaving us excited about what can be achieved this year! Well done to all the children taking part, with special mentions to Jude, Harry, Ava and Abigail who all had super debut performances. 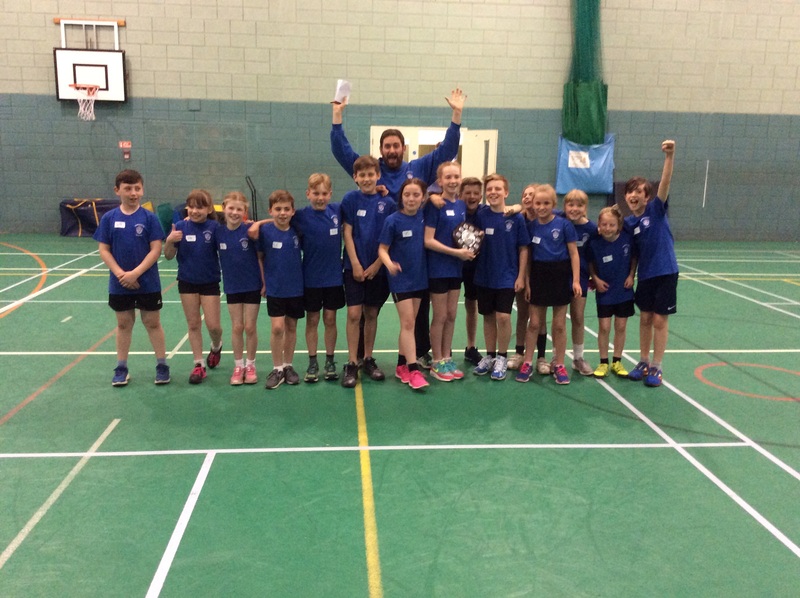 Venturing out on a freezing cold afternoon and after a couple of last minute team changes due to illness, the A Team put in some super performances to take second place overall with 201 points, narrowly beating Lancaster Road, whilst Westgate stormed ahead to win comfortably. Highlights for the boys team included a fantastic run by Joey in the 4 lap race, winning his heat by a considerable lead and taking first place, closely followed by Freddie winning his heat and taking second place. We also had a dynamic duo in the javelin, with Theo taking first place with a throw of 19.50m, closely followed by Jack M in second place with a throw of 19.25m. Freddie also took second place in triple jump and third place in long jump. A special mention to Matthew, who lost the 'ip dip' to fill in for our missing hurdler, but did it with a big smile on his face!! For the girls, sprinting superstar Bethany took first place in both the 2 lap sprint and the hurdles, along with second place in the 4 lap. Elise took second place in both the speed bounce and the triple jump. Another great night at the B Team competition, with a host of super performances from the team! Luca took third place in both the hurdles and the two lap sprint and finished off his individual performances with first place in the long jump. 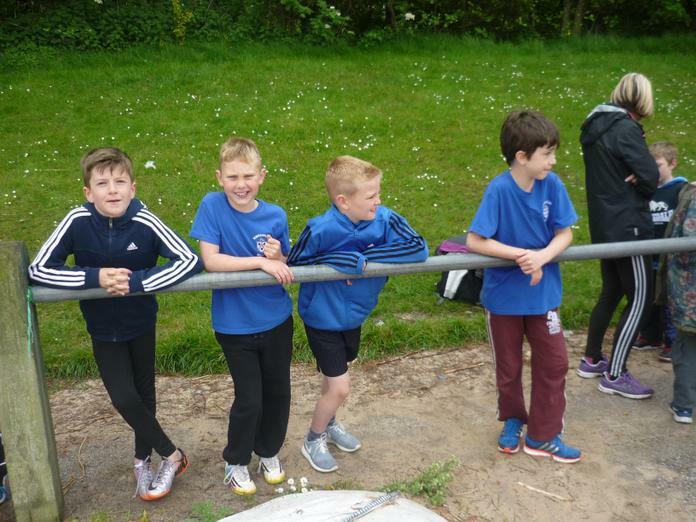 A great hurdling performance from Beau saw him take second place, whilst Joey took second place in both the two lap and four lap races, along with third place in the triple jump. 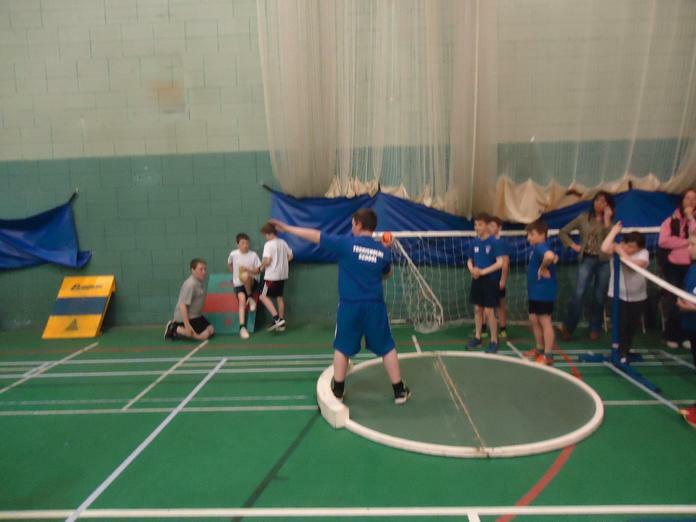 Jack Mount improved on his personal best to take first place in the javelin competition, with a huge throw of 19.50m. 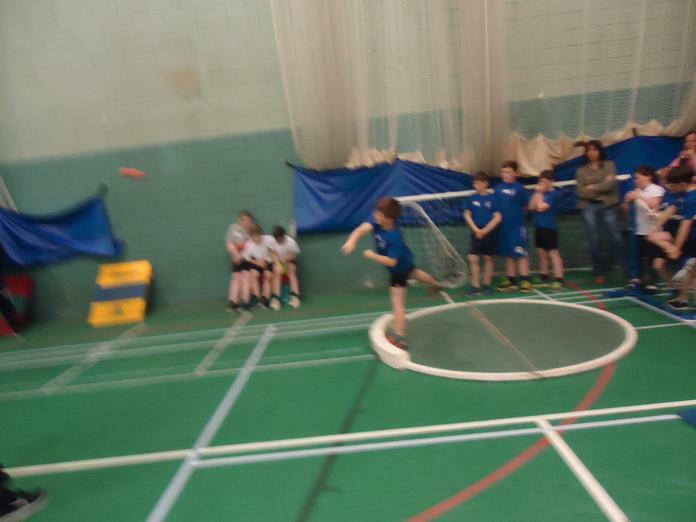 Will also threw well to finish in second place in the shot putt, whilst Alex finshed first in the speed bounce yet again! Erin got the girls of to a great start with a personal best in the hurdles, taking second place overall, despite losing a shoe in the first lap!! She also took third place in the speed bounce. 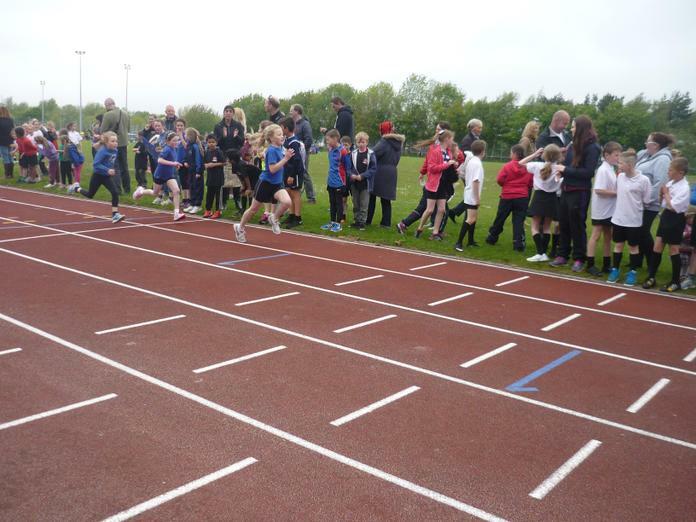 Amy ran another excellent 4 lap race, winning her heat by a considerable margin and taking first place overall! 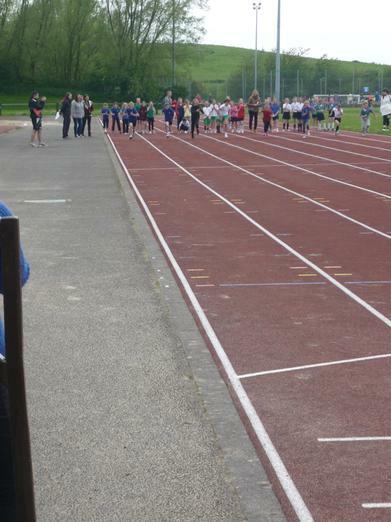 Evie took third place in the javelin and ran a strong race in the 4 lap, competing in this event for the first time. Keisha took first place in the shot putt with an impressive throw of 4.90m. Eva took third place in the long jump and Kierra finsihed first in the speed bounce once again. 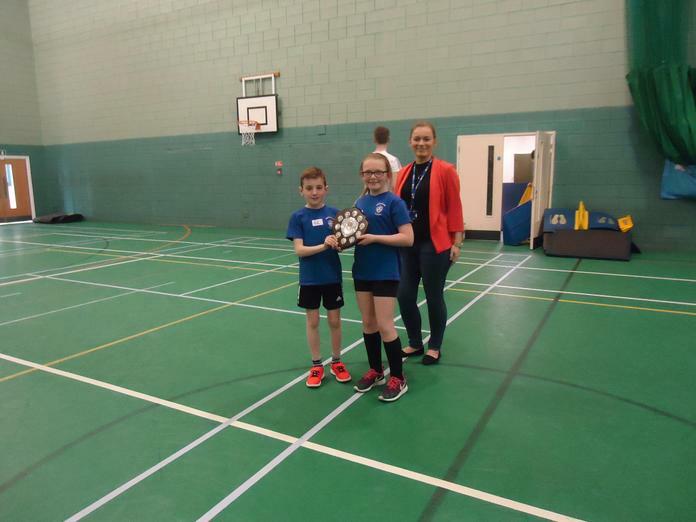 In a repeat of our competition a few weeks ago, the fabulous relay team took first place to see Torrisholme finish in first place overall! A great team performance! Thank you to our super supporters! It had been a while since the B Team last competed and they were raring to go! As always, the children gave it their all. Highlights included Luca taking first place in the hurdles and speed bounce and second place in the long jump. Alex matched Luca's 39 bounces to come joint first in the speed bounce. Beau took third place in the hurdles, Joey ran a great 4 lap to take second place, along with third place in the javelin. Jack Mount took second place in the javelin with a great throw of 17.50m and Will took third place in the shot putt with a throw of 6.05m. 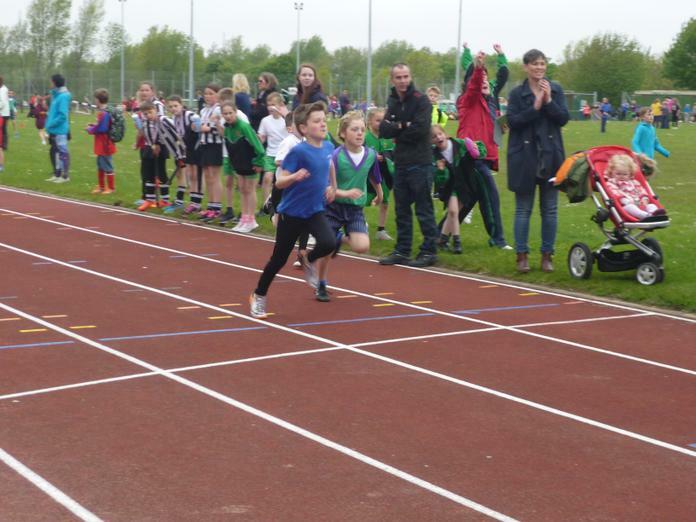 For the girls team, Evie ran a great 2 lap sprint to take third place, whilst Amy's super, heat-winning 4 lap performance saw her take second place overall. 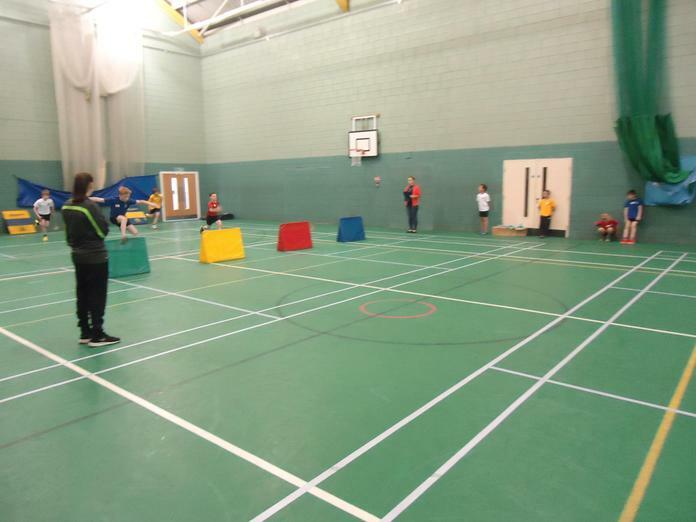 Keisha took second place in the shot putt competition, whilst Kierra bounced her way to first place in the speed bounce. 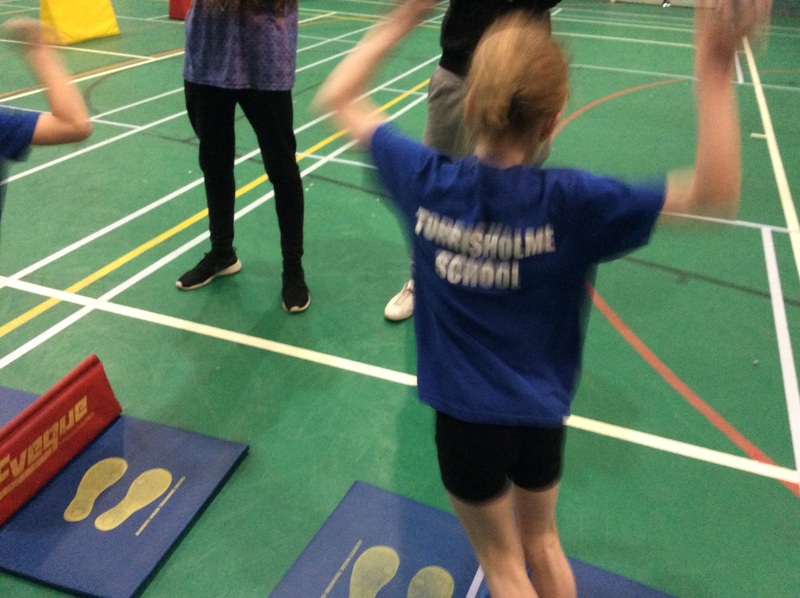 Team Torrisholme sure can bounce!! After much work on handovers, the relay team of Joey, Luca, Eva and Evie finished in first place for a nail-biting finale. Overall, a final score of 217 put Torrisholme at first place at the end of the competition. A great performance all round! A special mention to Eva, who made her team debut after recovering from injury! After a long break since our last competition, the A team were raring to go! Highlights for the boys included Alex taking second place in the hurdles, Freddie taking second place in the 4 lap race and the triple jump and third place in the 2 lap race and the long jump, Lucas taking first place in the triple jump with an enormous 5.72m and second place in the long jump, Jack taking second place in the speed bounce, closely followed by Matthew in third place, Rohan winning the shot competition with a huge throw of 7.35m and Theo taking place in the javelin with a throw of 19m, depsite hobbling around on crutches all week! What a great team performance! 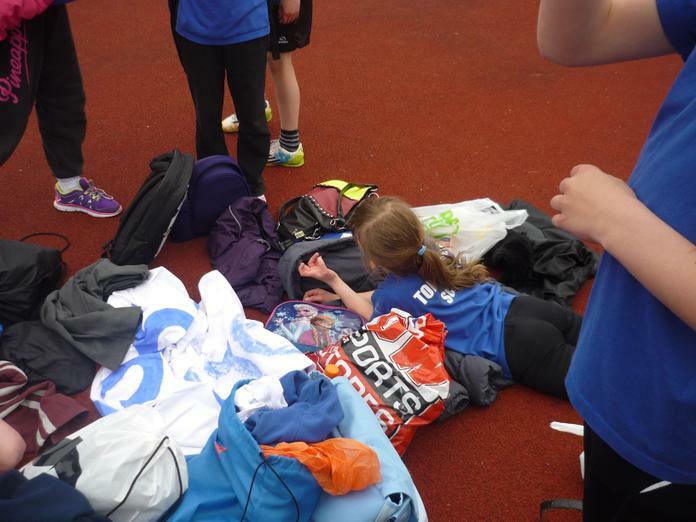 For the girls, highlights included Bethany taking first place in the hurdles, second place in the 2 lap race and third place in both the 4 lap race and the long jump, Elise taking first place in the triple jump with a massive 5.54m and Sylvie taking third place in the triple jump. 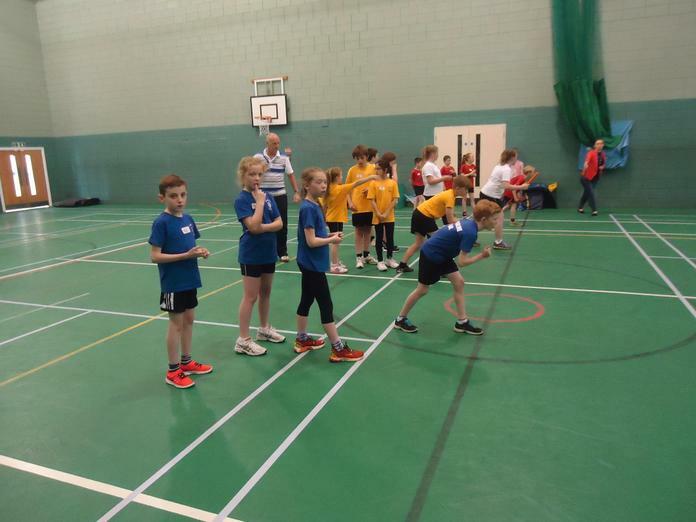 The competition finished with a closely fought relay, with Team Torrisholme taking third place in the race. 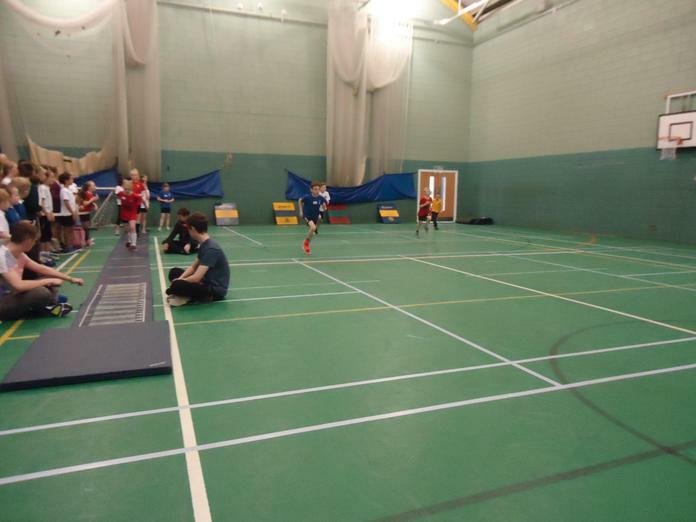 In the first league competition of the season for the B Team, many of our athletes were making their indoor athletics debut! And what a debut it was!! 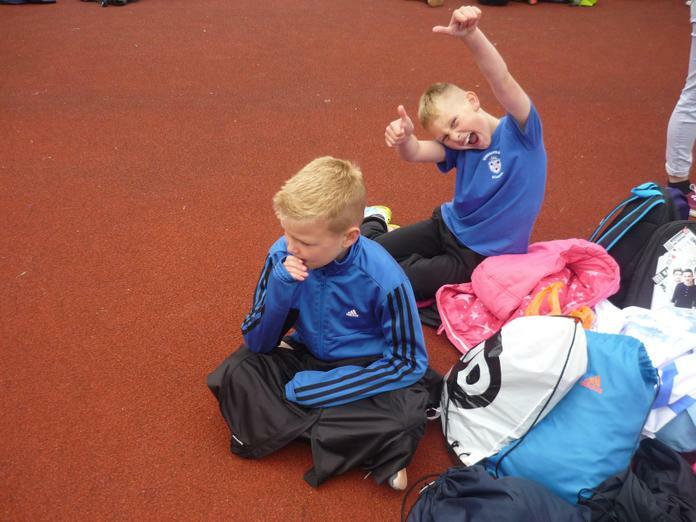 We were very proud of all the children for the effort they showed in their events, but also the amazing team spirit and encouragement they showed their team mates. 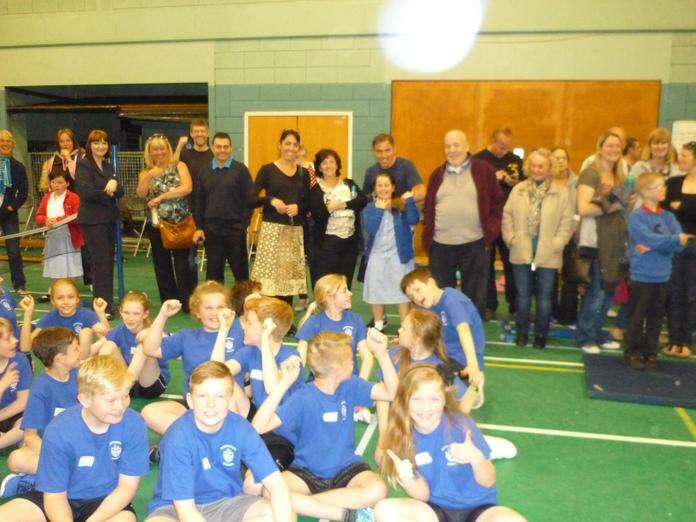 It was also great to have such a great turn out of parents supporting the team - thank you! Full results are below, but the edited highlights for the boys include a super performance from Luca, who took third place in the hurdles and the long jump, Will taking second place in the shot putt, Alex taking second place in the speed bounce and the triple jump, Lucas taking second place in the long jump, Jack M taking second place in the javelin and fantastic runs from Joey and Zach in the 4 lap race. Zach had a great race, winning his heat with an impressive lead. Final times put Joey in second place and Zach in fifth place. For the girls, Amy had an amazing run in her heat, winning comfortably and coming third overall. Eva put in great performances, throwing an impressive 6.07m to come second in the shot, 12.75m in the javelin to come third and jumping her way into second place in the triple jump and first in the speed bounce! 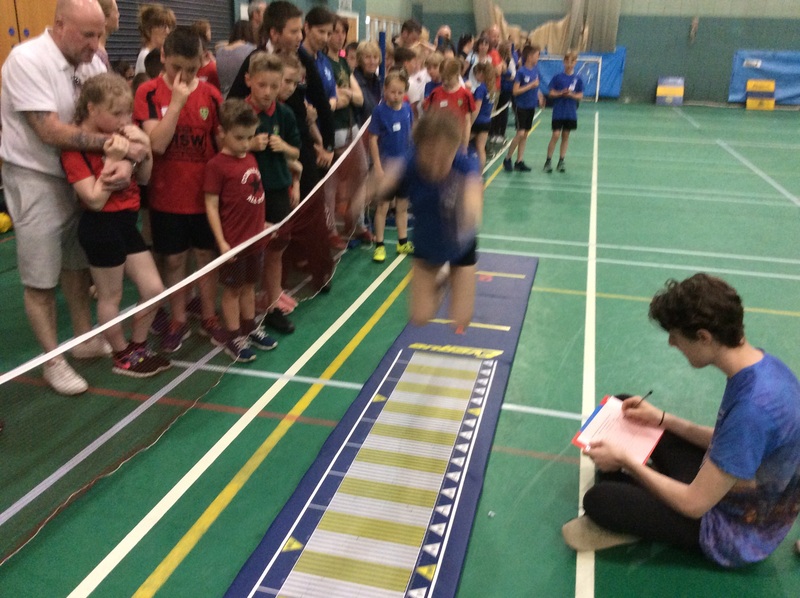 Kierra also equalled Eva's speed bounce score to make first place a two-way Torrisholme tie! 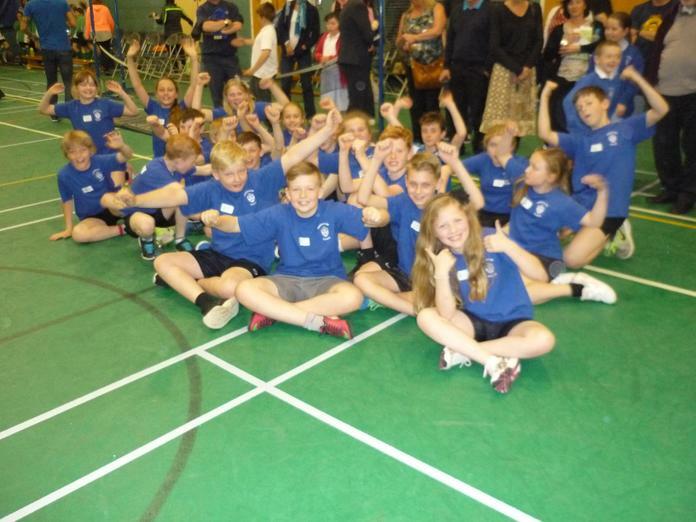 As the results came in, Team Torrisholme were delighted to be in first place out of the five schools competing. However, shortly afterwards, an error by the organisers was corrected and Torrisholme were nudged into second place, losing out by just two points! 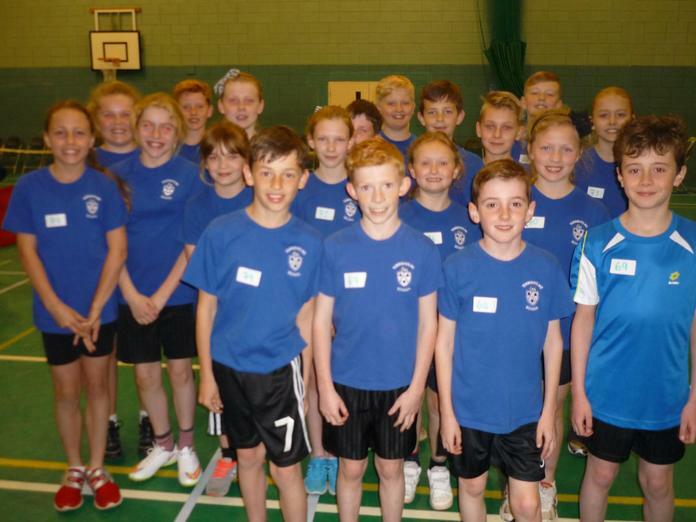 We look forward to seeing what this team can achieve this year - well done everyone! 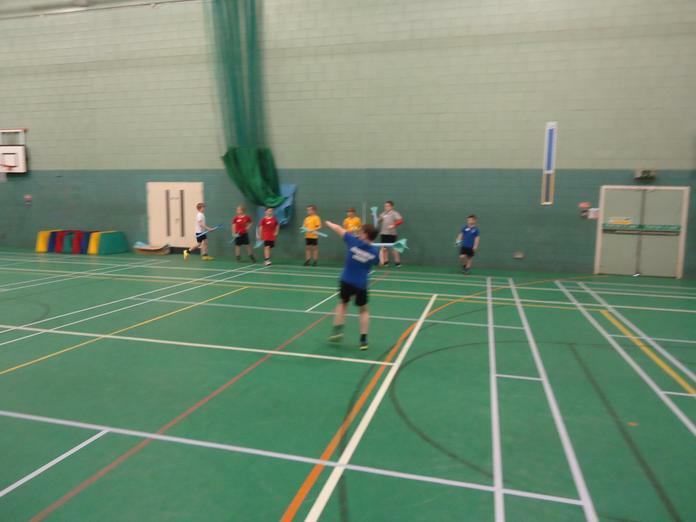 Friday afternoon saw the first week of competition in the A Team League at Lancaster and Morecambe College. 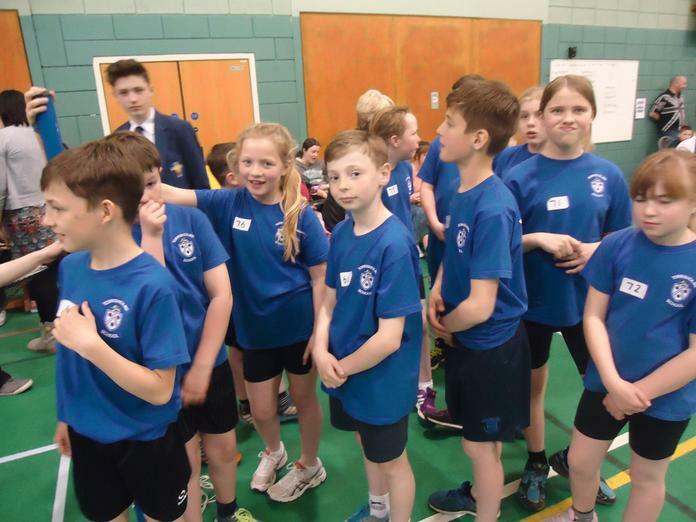 Competing against Westgate, Slyne with Hest, Grosvenor Park and Bolton-le-Sands, many of our Year 5 and Year 6 athletes were making their competition debut! 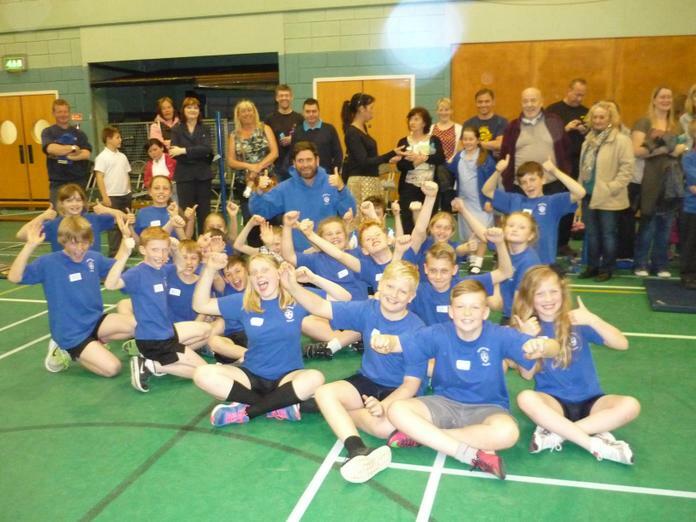 A fantastic effort from all our athletes and a great time spirit led to some great results. In the boys competition, Alex showed great promise in the hurdles event, taking 2nd place against many experienced competitors. 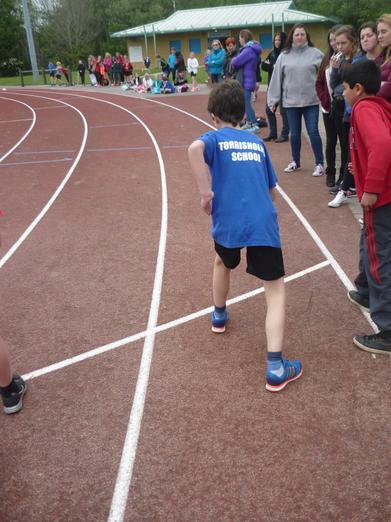 Freddie put in a series of great performances to take 2nd place in the long jump and triple jump and 3rd place overall in the 4 lap race, after winning his heat. Theo threw a massive 19.25m, to take 2nd place in the javelin whilst Rohan took 2nd place in the shot putt with a throw of 6.70m. Matthew also took 3rd place in the speed bounce, with a score of 39 bounces in 20 seconds. 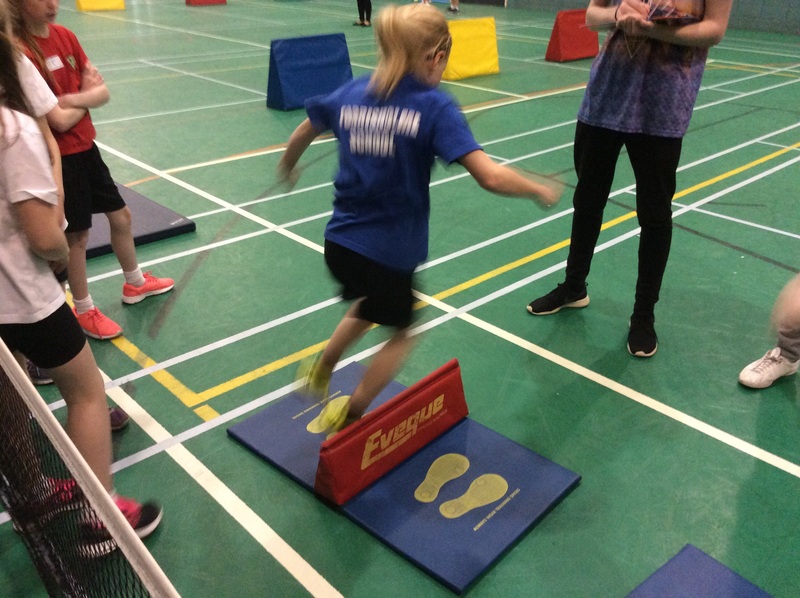 The girls' team also put in some great performances, most notably, Erin and Elise jumping 44 and 49 respectively in the speed bounce competition, both of which would have been enough to win the boys' competition! 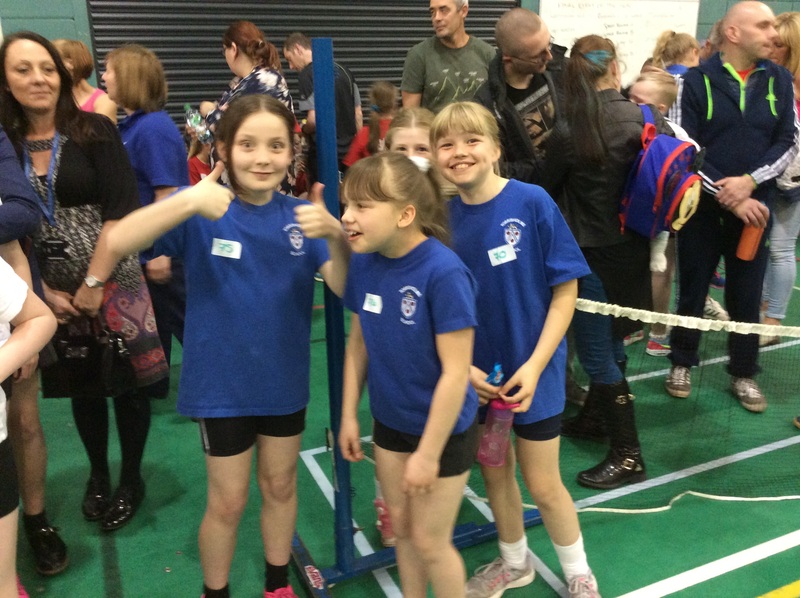 However with some seriously speedy girls competing, they secured 8th and 5th place! Elise also took 3rd place in the triple jump. New squad members Keisha and Sylvie showed great promise in their events on this first outing of the season. Overall, Torrisholme came in 4th place on this occasion, after 2nd, 3rd and 4th place were closely fought throughout the evening. We look forward to seeing the team improve as we train. Well done everyone! 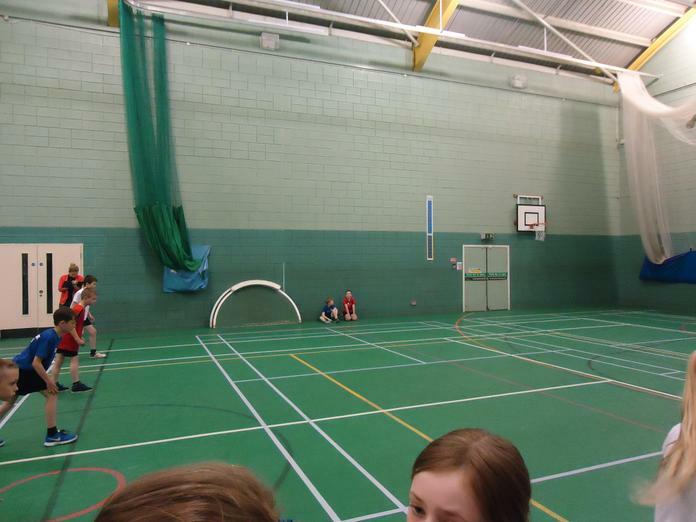 Our B Team was stretched to its limits on the day of the final league competition! 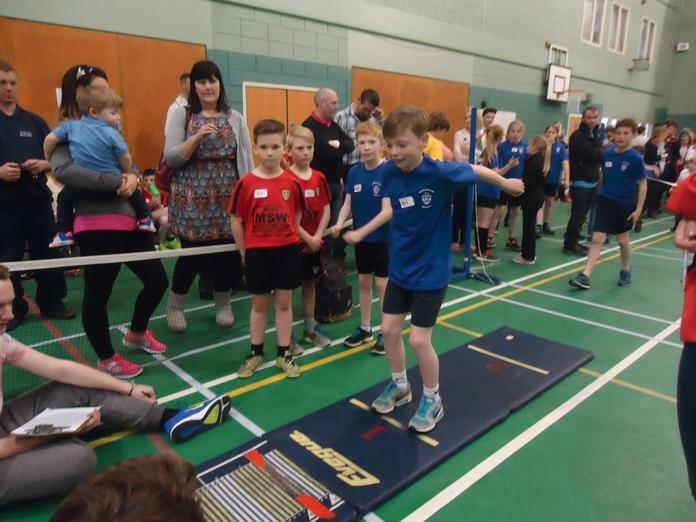 Due to illness and other commitments, a number of children stepped up to compete in events that were new to them, doing so with fantastic team spirit! Highlights in the girls' competition included Ceira taking 2nd place in the hurdles, Lucy (who competed in 6 different events!) taking first place in the speed bounce and 3rd place in the hurdles and Emily Taking 3rd place on the shot, 2nd place in the speed bounce and 1st place in both the long jump and triple jump! Fabulous performances from the girls! 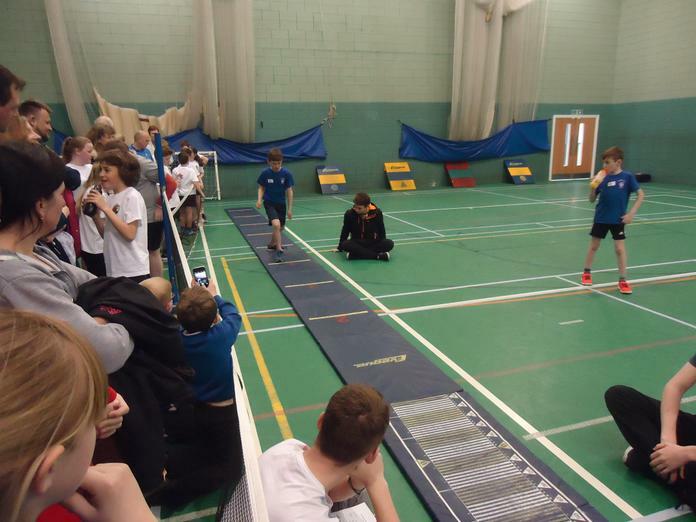 In the boys' competition, Joe took 3rd place in both the hurdles and 2 lap, Rohan took 3rd place in both the javelin and shot, and Jack took 1st place in the speed bounce. 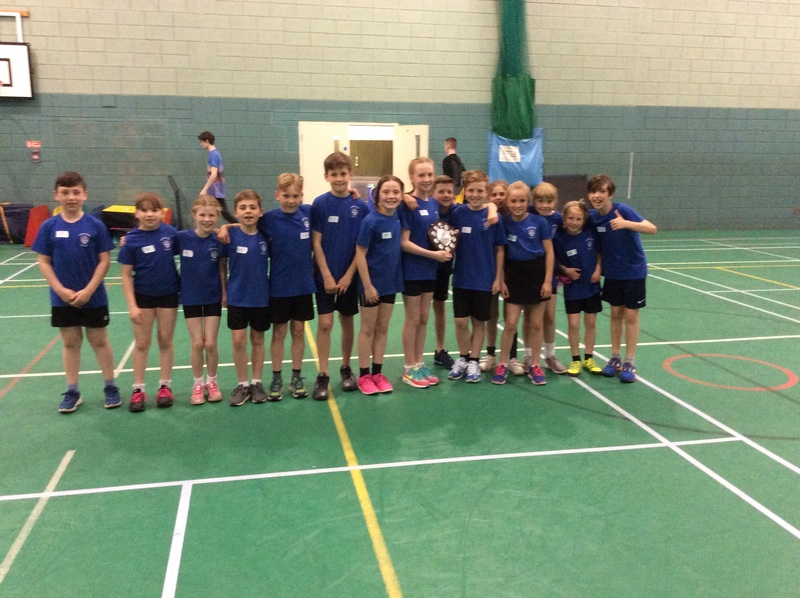 Once the overall scores were counted, Torrisholme were delighted to be awarded 2nd place in the B Team League. Well done to everyone who has taken part this year! 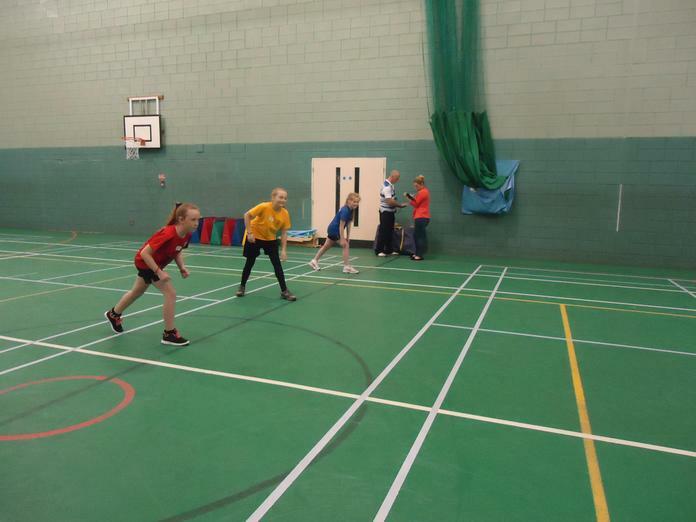 In the final competition of this year's A Team League, we lined up against our closest rivals - Lancaster Road, St Peter's and Bolton-le-Sands for what was bound to be a nail-biting finale! As usual, our team represented the school brilliantly, supporting and encouraging each other and giving their events their all. Highlights for the boys included Ashton winning the speed bounce event, Matty taking 2nd place in the long jump, Will W taking 2nd place in the javelin and Will J taking 3rd place in both the long jump and triple jump competitions. 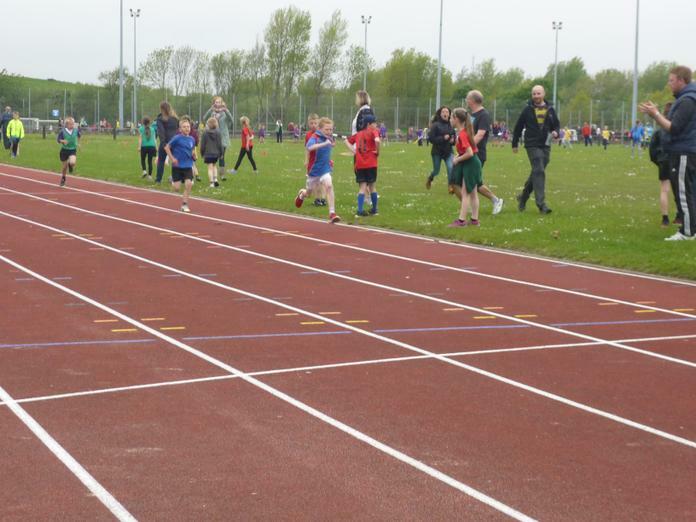 In the girls' competition, Bethany took 2nd place in the 4 lap and 3rd place in the 2 lap hurdles, Olivia took 2nd place and Ruby took 3rd place in the speed bounce, whilst Sacha finished with an amazing 1st place in the 2 lap, 4 lap and shot putt and 3rd place in the triple jump. 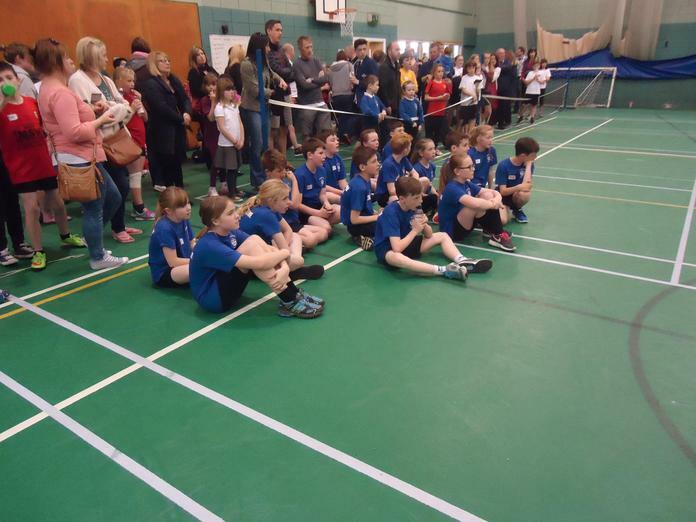 As has been the case in many of our league competitions, illness meant that we had some changes to the team and the events that the children were taking part in. We have been very proud of the way the have re-organised themselves and been so adaptable. The final scores put us in 3rd place overall - a great result! What a fabulous team they have been! 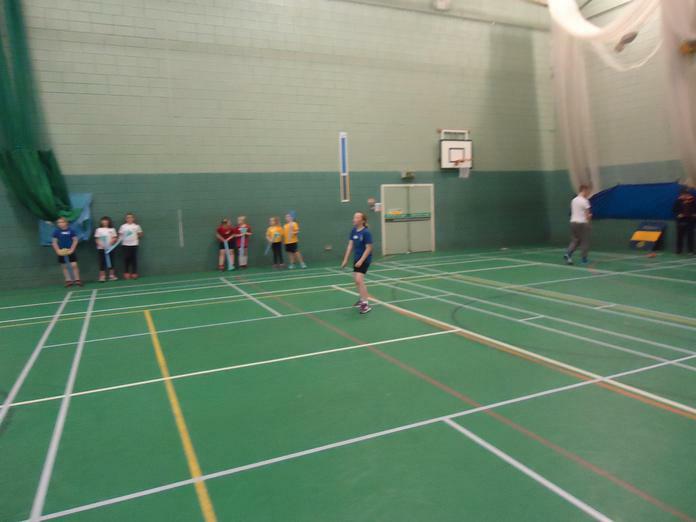 Friday was our final B Team competition and what a close run, nail-biting afternoon it was! 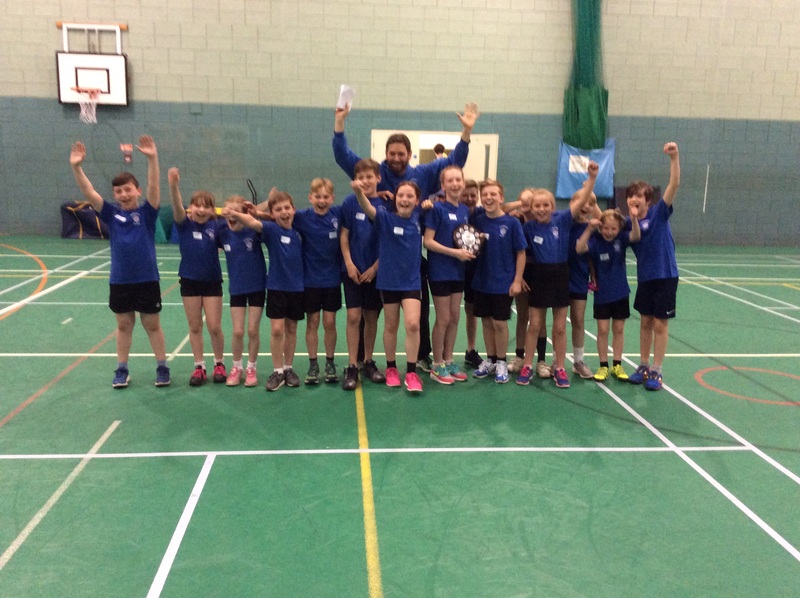 Opponents from Grosvenor Park, St Peter's and Moorside fought hard to make the competition exciting with the lead changing a number of times, with the top three schools staying within 10 points of each other throughout! 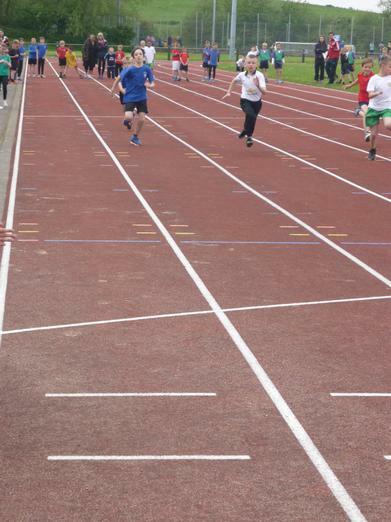 Top performances from the boys' team included Theo taking third place in the javelin with a throw of 15.25m, Logan taking third place in the shot putt with a throw of 5.52m, Oliver taking third place in the triple jump with 5.04m and Jack taking first place in the speed bounce with a score of 43, closely followed by Oliver in second place with a score of 42. 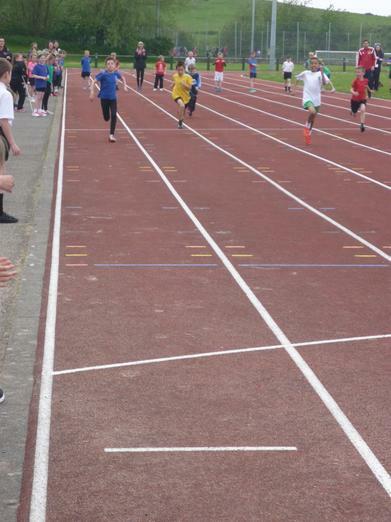 For the girls, Emily had an outstanding competition, coming in first place in all four of her events - A throw of 5.62m in the shot putt, 1.68m in the long jump, 4.96m in the triple jump and a score of 41 in the speed bounce! Well done, Emily! 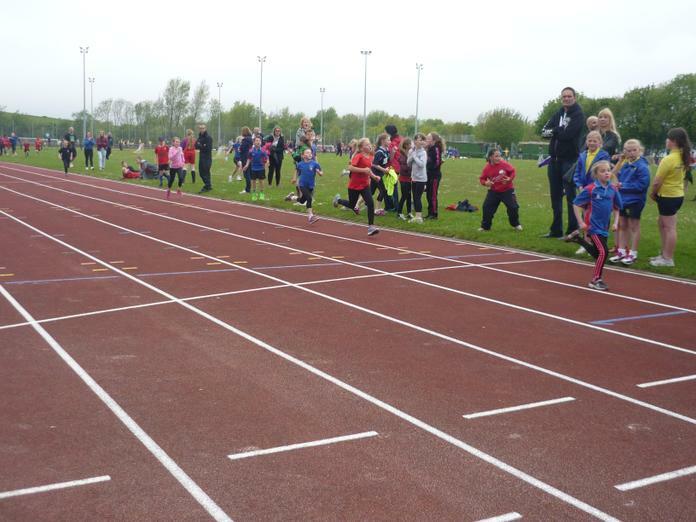 Also performing brilliantly, Ceira took first place in the 2 lap sprint and second place in the 2 lap hurdles, Elise took third place in the 2 lap hurdles, Lucy took third place in the 4 lap race and second place in the speed bounce and Ciara took second place in both javelin and long jump. Finally, a super star team of Oliver, Joey, Ceira and Elise took second place in the relay. As always, we were very proud of a great team spirit, with all members of the team giving their events their all and supporting and encouraging their team mates - well done everyone! Final scores in this week's competition saw Moorside in 4th place with 72 points, Torrisholme in 3rd place with 170, St Peter's in 2nd place with 175 and Grosvenor Park winning with 180. We await the final league positions with our fingers crossed! Despite missing a few members of our squad, our A Team put in a series of super performances on Friday afternoon, including a school record-breaking javelin throw from Sarah! The girls' team highlights included Bethany taking first place in the 4 lap race and third place in the two lap hurdles, Sacha taking first place in the shot putt and third place in triple jump, Ruby taking second place in the speed bounce, Olivia taking third place in the speed bounce and Sarah throwing an amazing 13.00m in the javelin competition to break the current school record of 12.50m and take second place in the competition. Well done, Sarah! The boys' team highlights included Ashton taking first place in the speed bounce, second place in the long jump and third place in the four lap race, Matty taking first place in the long jump, second place in the 2 lap race and third place in the triple jump, Will taking second place in the javelin and third place in the 2 lap hurdles and Kenzie taking third place in the shot putt. 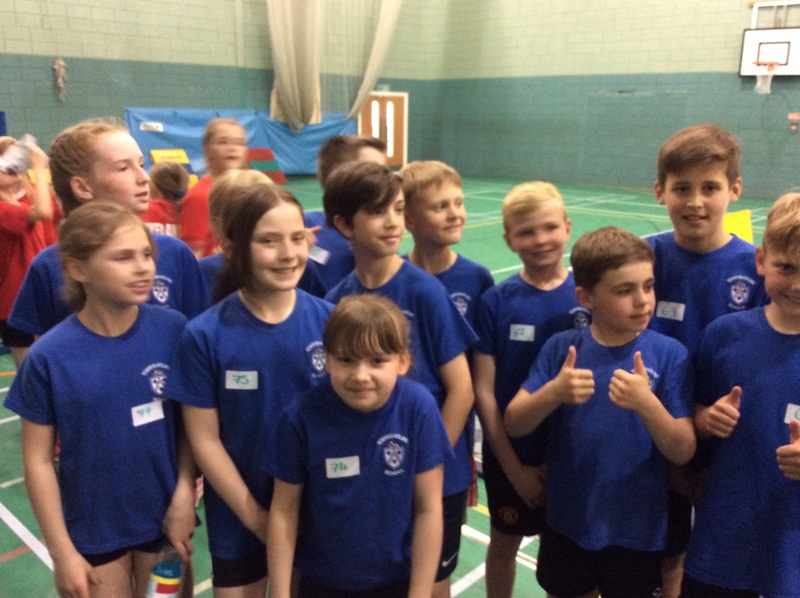 Finally, our relay team came second to give us a grand total of 187 points, narrowly beaten by Bolton-le-Sands who scored a total of 213. With everyone fresh and raring to go after the Christmas break, the A Team made a great start to 2017! 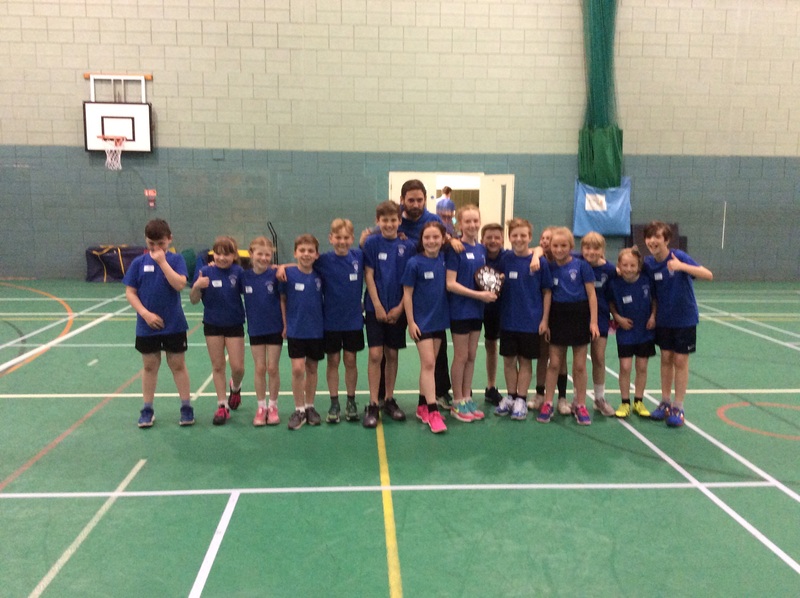 Competing against Bowerham, Slyne with Hest and Lancaster Road, the children put in some great performances to take first place at this week's meet, leading their closest rival by 42 points with a total of 191! For the boys, Kenzie took second place in the 2 lap hurdles, Will W and Max took first and third place respectively in the javelin, Will J and Ashton took second and third place respectively in the long jump, Will J took third place in the triple jump and Kenzie and Ashton took second and third place respectively in the speed bounce. Kenzie was unlucky not to win, scoring an impressive 50 bounces!! 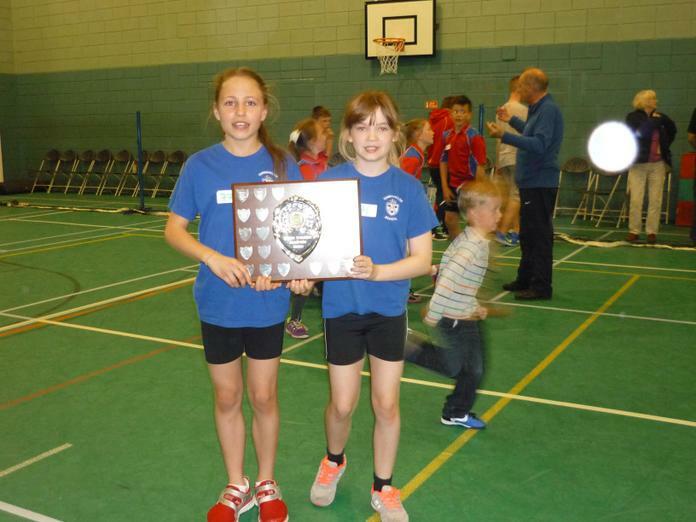 For the girls, Bethany took first place in the 2 lap hurdles, Sacha and Ruby took first and third place respectively in the 2 lap sprint and Sacha and Bethany took second and third place respectively in the 4 lap race. A great night's running from the girls! Sarah took second place in both the javelin and the shot, with Sacha winning the shot competition with a throw of 6.90! Sacha also took second place in the triple jump and Olivia and Ruby took first and place respectively in the speed bounce. A great night's competition! Well done to all our team! This week, quite a few members of our usual team were hit by illness, meaning a few children were enlisted for their first appearance at the last minute. What a great team they made!! Lining up against Lancaster Road and Ryelands, spirits were high and the children offered one another great support and coaching. 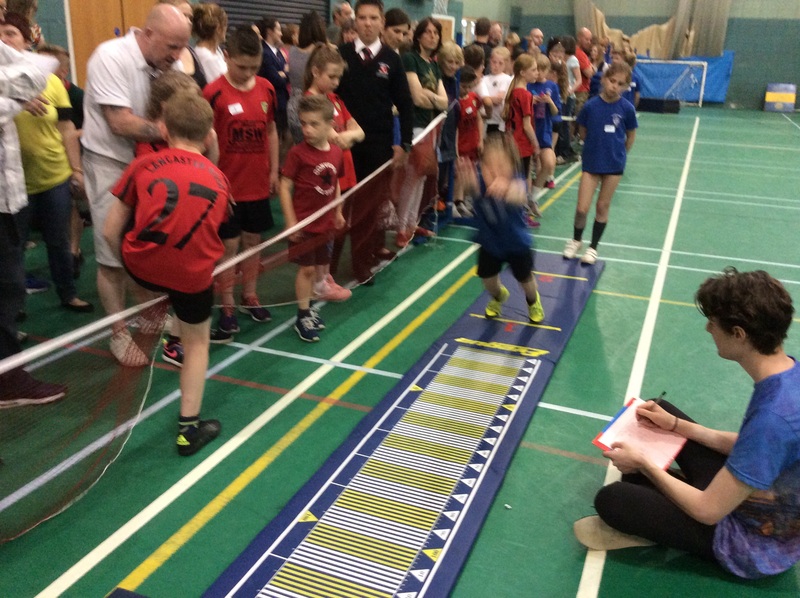 A first appearance for Oliver saw him win first place in the 2 lap hurdles by quite a margin! He also took fourth place in the 2 lap sprint and third place in the long jump. 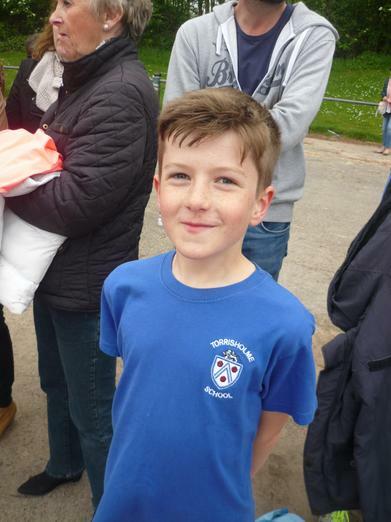 Theo took third place in the javelin, with a throw of 15.00m! 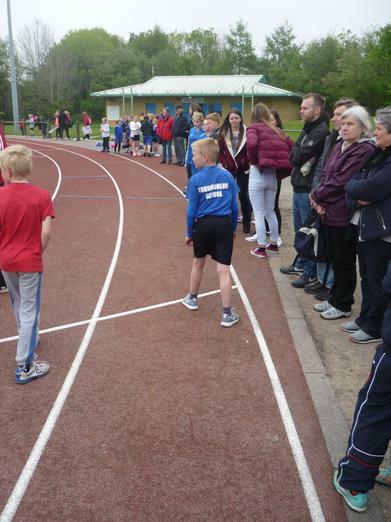 Logan also made his debut, taking fifth place in the 2 lap race and throwing 5.32m in the shot putt. 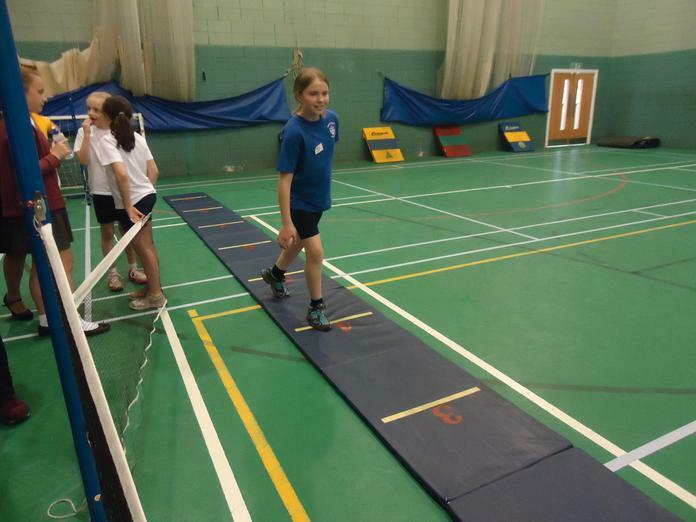 Eva, who took part in the competition for the first time, took part in the 2 lap hurdles, 2 lap sprint, 4 lap race, speed bounce and relay! She was unlucky to take fourth place in the 4 lap, after earning a strong lead but becoming a little bit confused about where the finishing line was! Jessica also made her debut in the javelin event, with a super best throw of 11.80m. 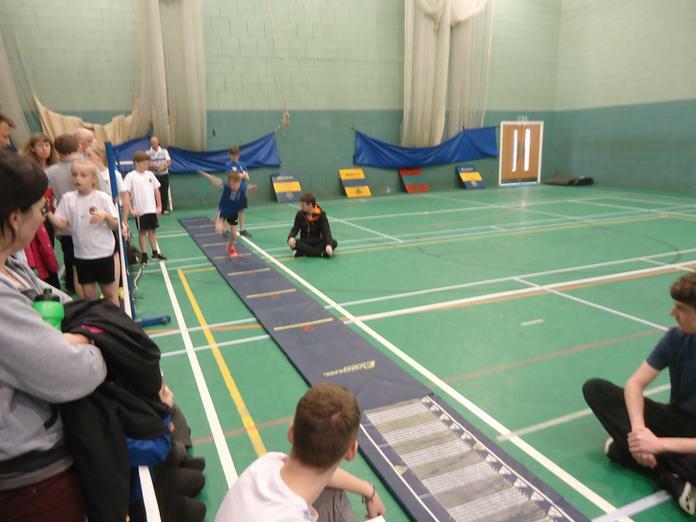 Performances from the rest of the team included Jack taking second place in the speed bounce and third place in the triple jump and Joey taking second place in the 4 lap race and third place in the hurdles. The girls performed brilliantly, with Elise taking first place in the 2 lap hurdles and 4 lap race and third place in the 2 lap sprint, Emily taking first place in the speed bounce, second places in the shot putt and long jump and third place in the triple jump, and Ciara taking first place in the shot putt, second place in the javelin and third place in the long jump. Throughout the tournament, our scores ran very close to those of our closest rivals, Lancaster Road, with both teams drawing on points at regular intervals. In the end, we were pipped at the post to take second place overall. 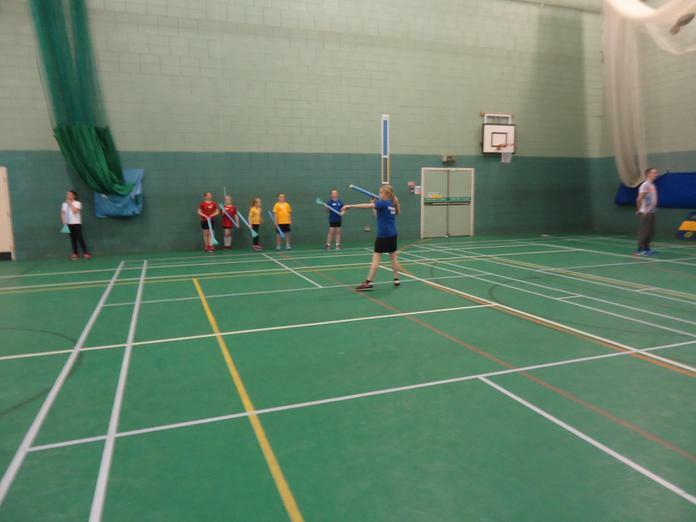 On Friday afternoon, the B Team took part in their first league appearance of the season, competing against Westgate, Lancaster Road and St Peter's. With poor Lucy missing her first competition due to illness, some of the other girls stepped up to take part her events and once again, team support and encouragement was fantastic. 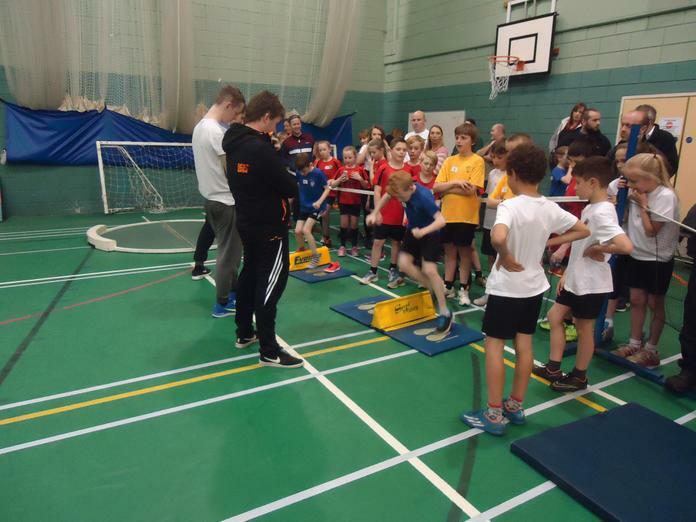 The highlights included winning performances from Joe in the 2 lap hurdles and long jump, second place for Max in the speed bounce and second place for Will in the shot. For the girls, Sacha and Ruby took first and second place in the hurdles respectively, Ceira took first place in the two lap race, a fabulous first ever performance from Elise in the four lap race - winning her heat and taking third place overall, first and second place in the shot for Ciara and Emily respectively, first place for Sacha in the long jump (smashing her personal best to pieces with a jump of 2.00m - wow!!) and first place for Emily in the speed bounce. 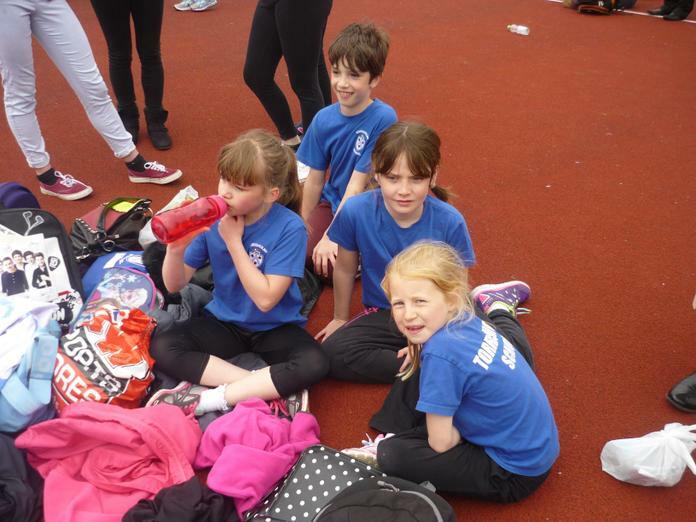 The relay team of Ashton, Max, Ceira and Ruby also took a convincing first place! 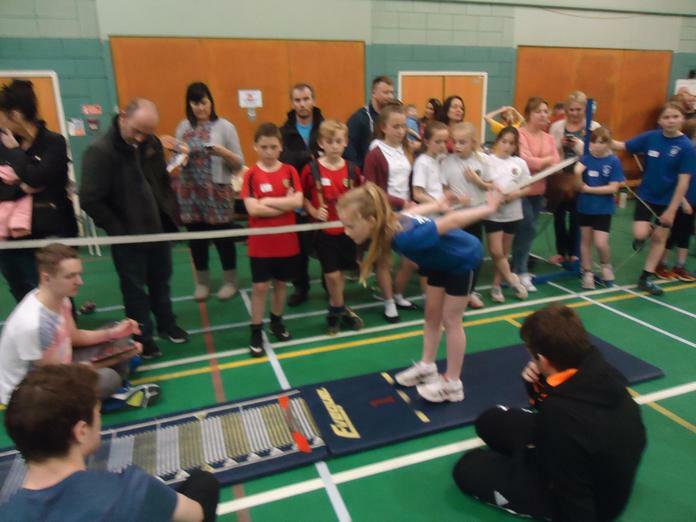 It was great to see many children taking part in the competition for the first time and fantastic effort from everyone, leading to some great performances. This put Team Torrisholme in first place overall with 175 points! 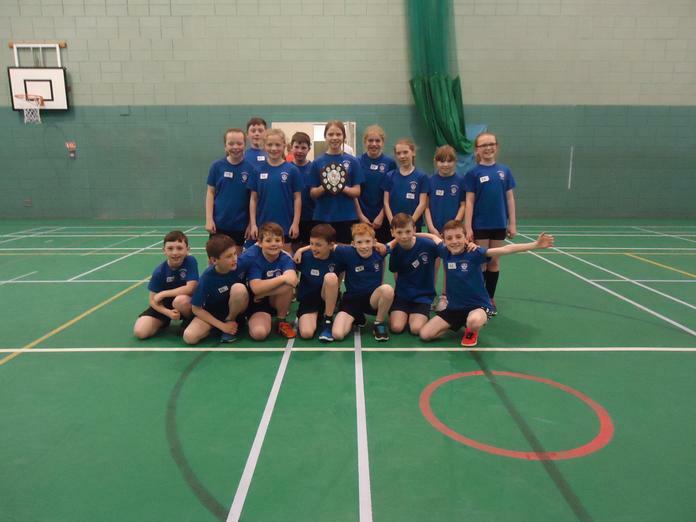 The A Team took part in their first indoor league competition under newly appointed coaches Miss Stalker and Mrs Price on 30th September, competing against St. Peter's, Slyne with Hest and Westgate. 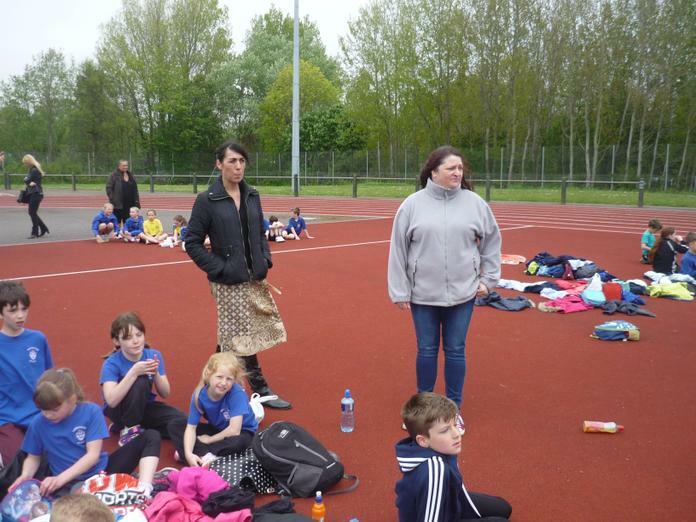 With much excitement and a sprinkling of nerves (the coaches! ), the team started the new season meaning business! A small hitch of Bethany and Miss Stalker being held up on a coach on the return journey of their Spaceport trip meant some last minute adjustments. Many of the girls stepped in to cover Bethany's events (all five of them!) at the last minute, with some of the girls taking part in an event for the very first time - eek! 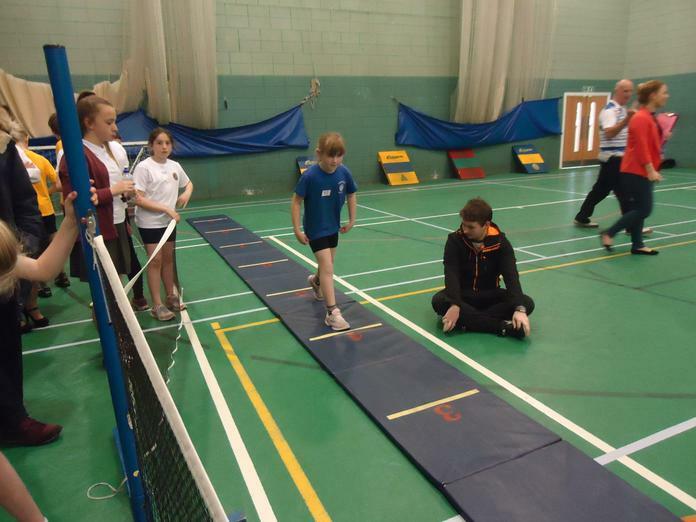 As a team, they all stepped up and supported each other brilliantly, with children coaching and encouraging other both before and during the events. 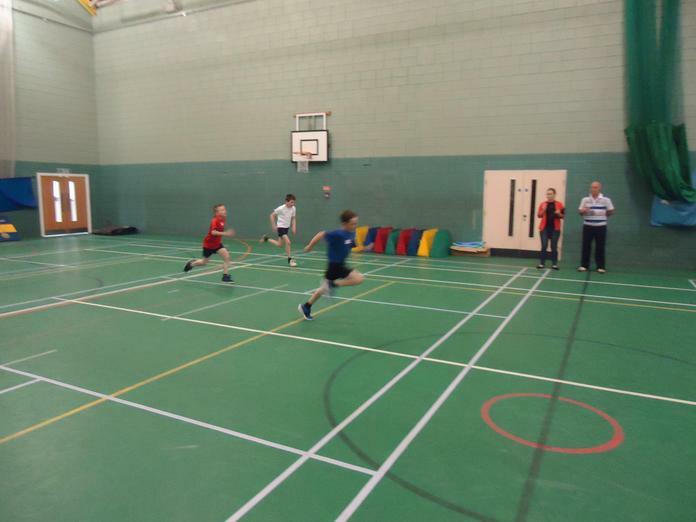 The highlights of the boys' team evening were Ashton winning the speed bounce competition, Matty taking 2nd place in the 2 lap race, Will J taking second place in the long jump AND triple jump competition and Max taking 2nd place in the shot. For the girls, Sacha took 1st place in the 2 lap and triple jump along with 2nd place in the 4 lap and shot, whilst Ruby took 1st place in the speed bounce and 2nd place in the long jump. To finish on an almighty high, our fabulous relay team of Matty, Joe, Sacha and Ruby took first place in the final event! When the final scores were in, we were delighted to take second place with 165 points, behind St Peter's with just 182 points. 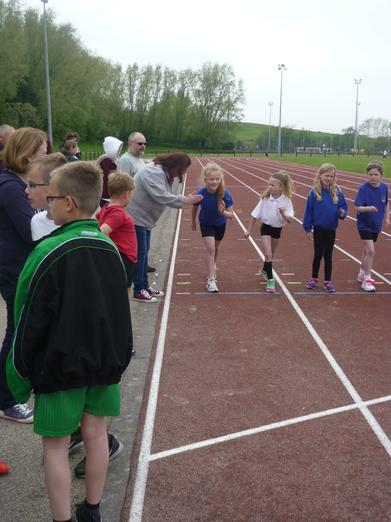 Points aside, I was extremely proud of the children's attitudes - giving each event their all, supporting, encouraging and coaching one another and smiling throughout! A truly great start to the season. 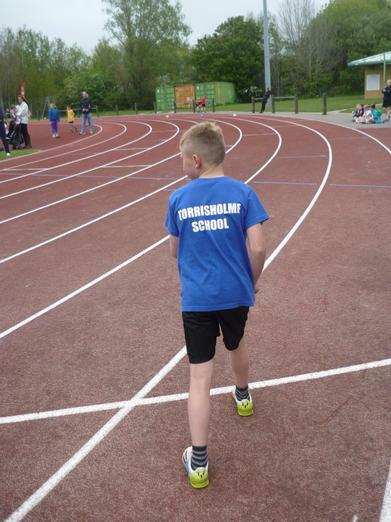 Individual results for the outdoor athletics tournament - well done to all! Final standings for the outdoor athletics tournament. 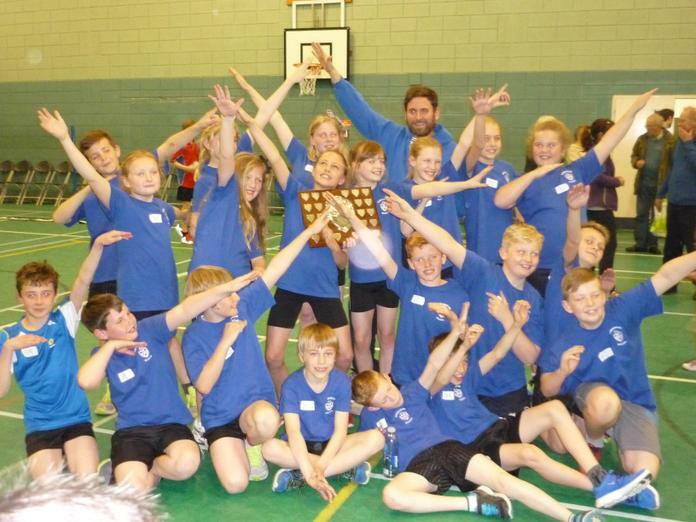 What a day - outdoor athletics champions for the third year in a row. 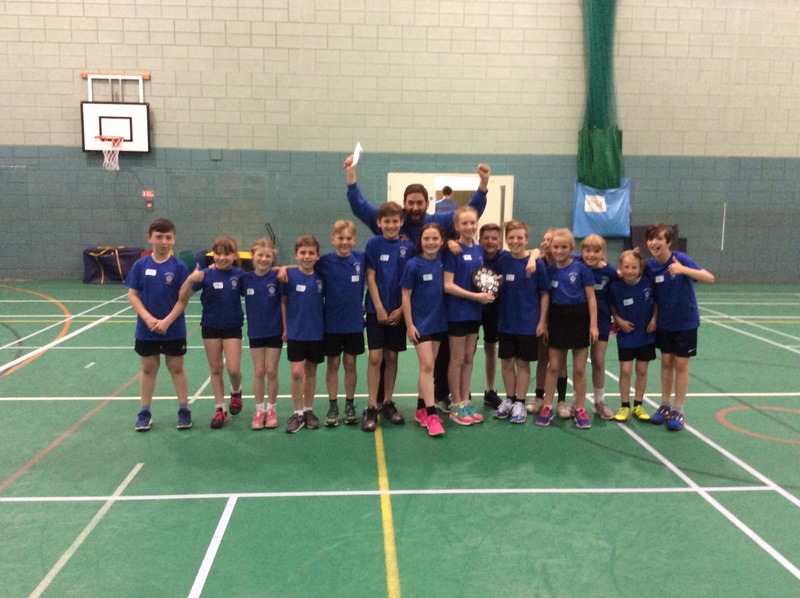 Great effort Quad kidders - 2nd place overall out of 14 schools. 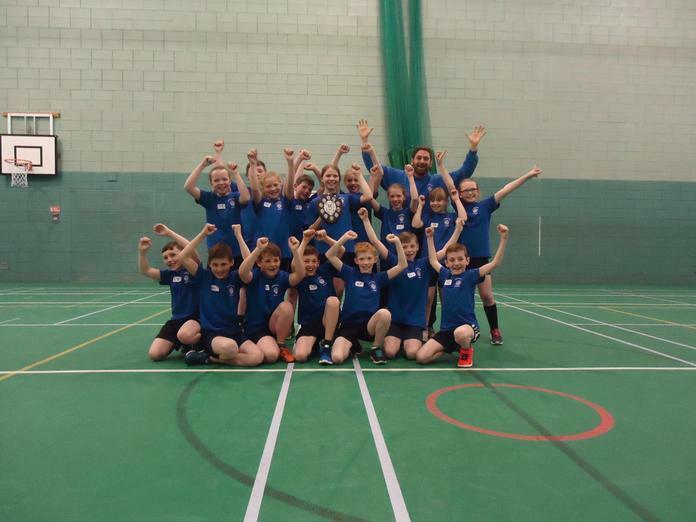 Another trophy -well done Team Torrisholme! 17 (seventeen!!) new personal bests tonight! Well done Torrisholme B - champions for the 3rd time in 4 years. 3 new school records - outstanding! The oldest records have gone; both shot putt records fall after 3 years. 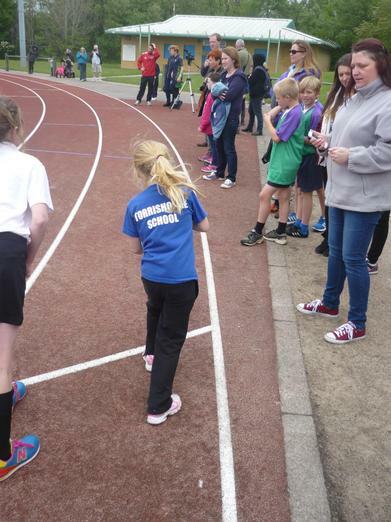 Torrisholme personal bests - well done to everyone! 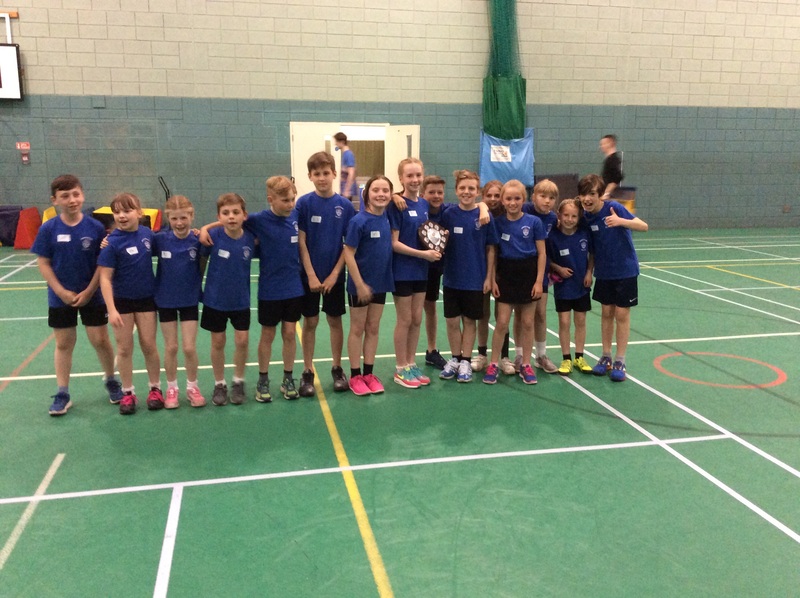 Torrisholme retain the Indoor athletics trophy - what a team!! You are all absolute superstars. B team win again - tight at the top! Personal bests - improvements all round. Another win for the A team - with a trainer missing! School records - 3 new ones. Well done Mia and Hayden. Individual personal bests - have you improved? 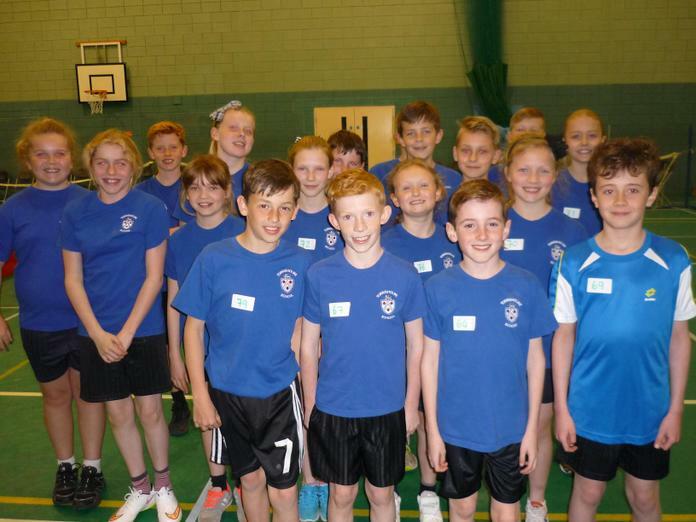 Here are the results of the large school qualifier - well done to all! This all put us 22 points behind St. Peter's but 60 points ahead of Lancaster Road in 3rd place - what an amazing result! 2nd again - well done to all who took part! 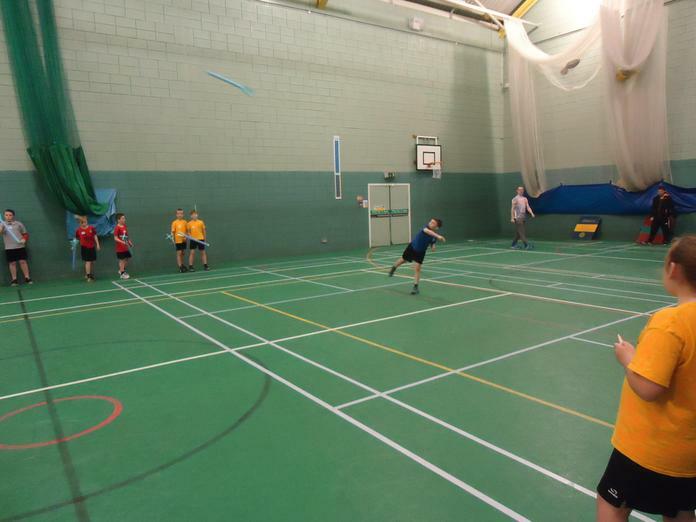 The Large School Qualifier is tomorrow (Friday 15th January). If you are helping to walk to the College, please can you make sure you are in School by 1:00pm as we will be leaving then. Also, the tournament will finish by 4:00pm so can you ensure your child is picked up by then. If your child's events finish early, you are welcome to take them. Check out these league tables - can we stay there?! Great performances all round! 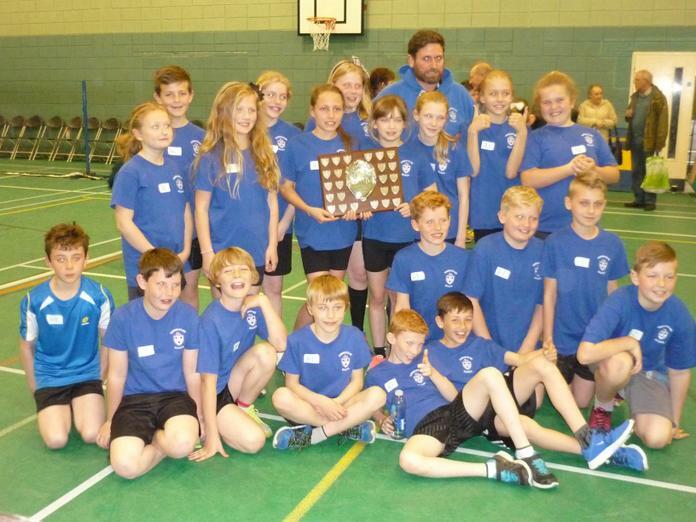 Well done to all of the B team athletes. Another win for the B team - 6 in a row! Personal bests - can you improve before the end of the season?! Here is the team for the Large School Qualifier on December 11th. Many thanks to all who took part in a hugely competitive trial - sorry I can't take you all! What a win for the B team - well done to all! Tournament personal bests for season 2015/16. 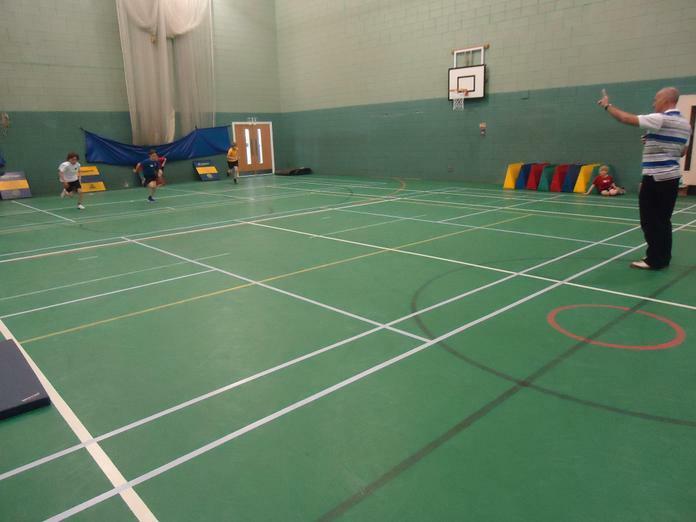 Due to tournaments at the college, there is no indoor athletics on Friday 20th November or Friday 11th December. 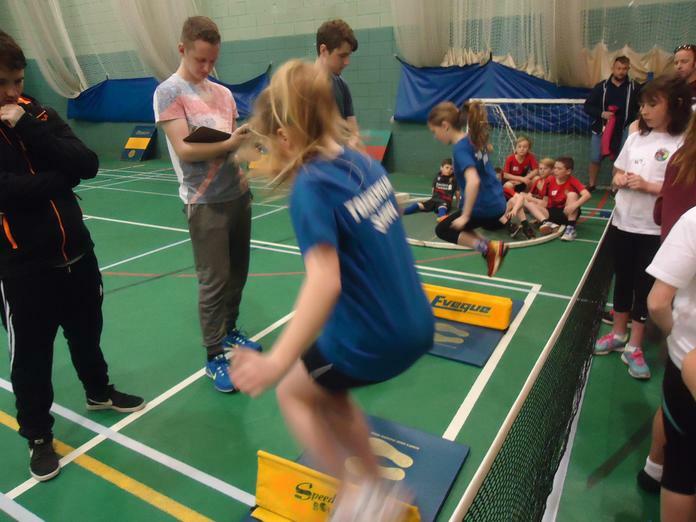 Due to the Christmas Fair, there is no indoor athletics on Friday 4th December. This makes Friday 27th November the last one before Christmas. Another great win for the A team. School records - check out Hayden's speed bounce and Mia's long jump. 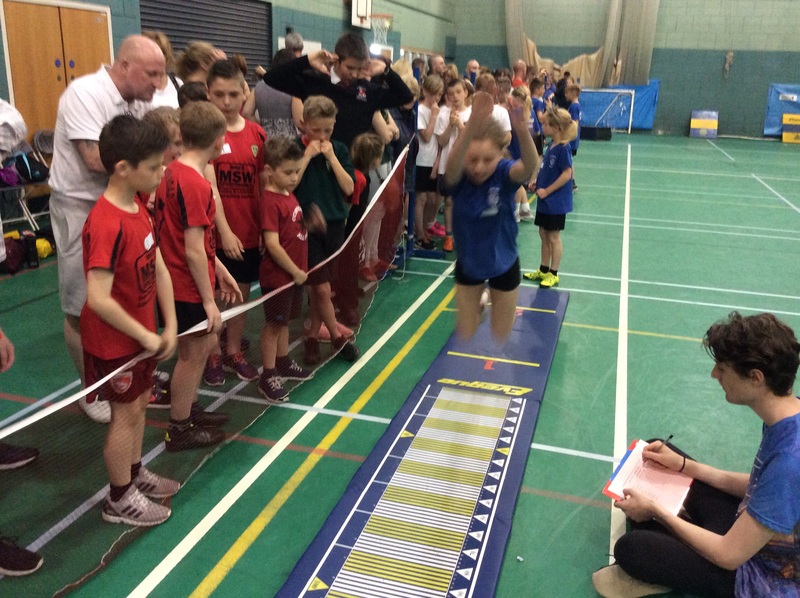 Here is the latest league table for the Indoor Athletics tournament. Here are the fixture dates for the rest of the year - please note, we are involved in the large school qualifier. I've alos attached the current A and B team squads so you can plan ahead. Records tumble as Torrisholme A win again. 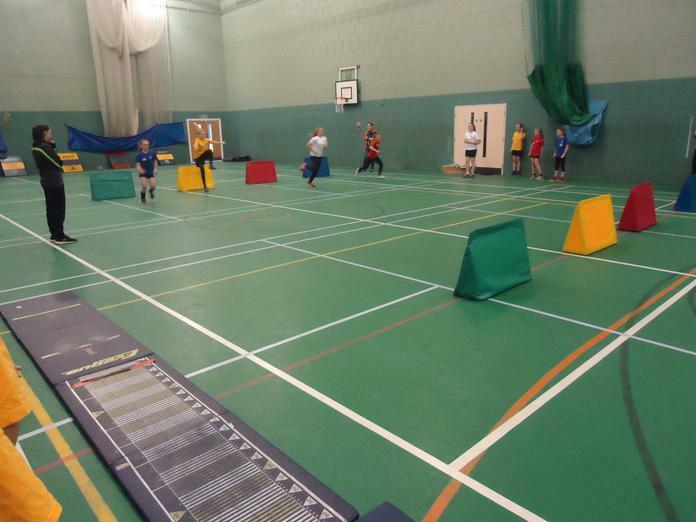 Indoor athletics club begins on Friday 11th September. Please return your letters as soon as possible. This week is running trials on the playground. 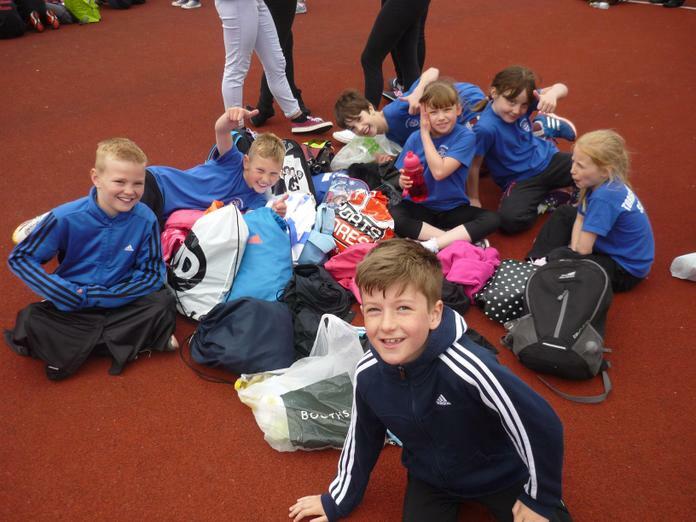 What a day at the district athletics tournament - well done Team Torrisholme! 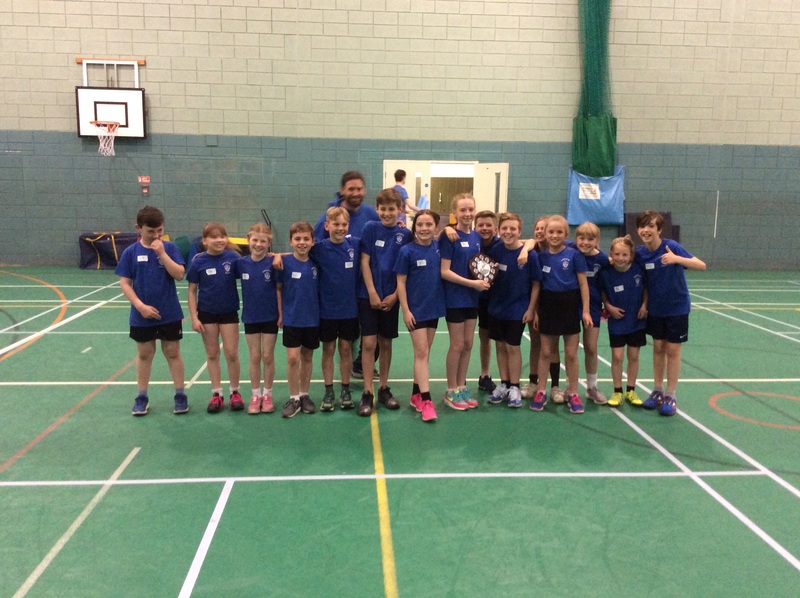 Well done to our 'quad kids' who finished 5th at the Primary sports festival. Sam Hayward, Will Walker, Kenzie Backhouse, Max Hustwick, Ceira Sanderson, Ruby Tague, Emily Ward and Sacha Liver. Check out the size of that trophy! Torrisholme do the double - what a year! 9 new school records - incredible! Personal bests - look how awesome our team is! 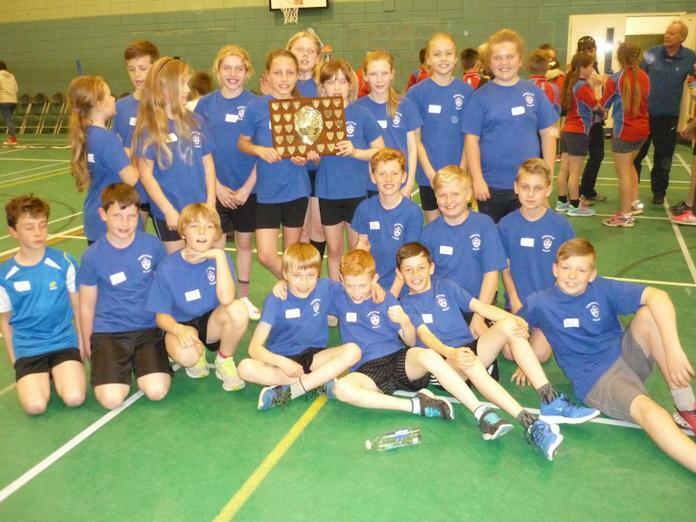 Torrisholme triumphant - another trophy! Torrisholme top the B league - can they win it? Who's the fastest and furthest. Check out these personal bests. 2nd in the A tournament and 3rd in the B. There are 4 events in each league so we have a fighting chance of winning both. What a win by the A-team. Only 1 point behind now - watch this space! 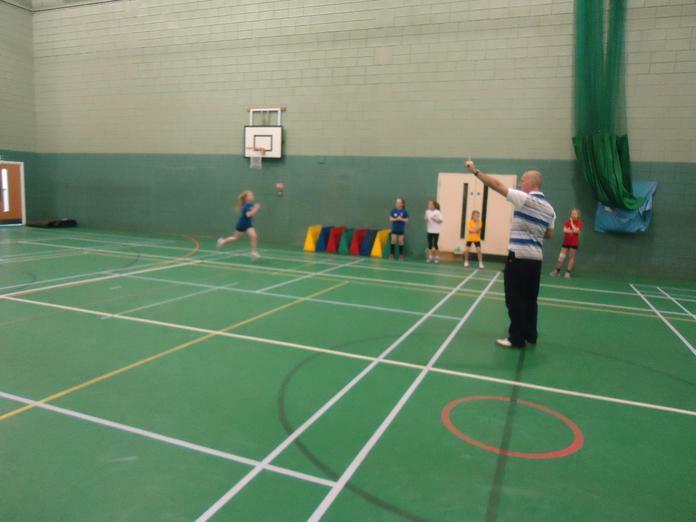 Well done to all those who have improved their personal bests - who is the fastest now? Elysha finally makes it onto the school honours board - surprisingly not for running. Well done! 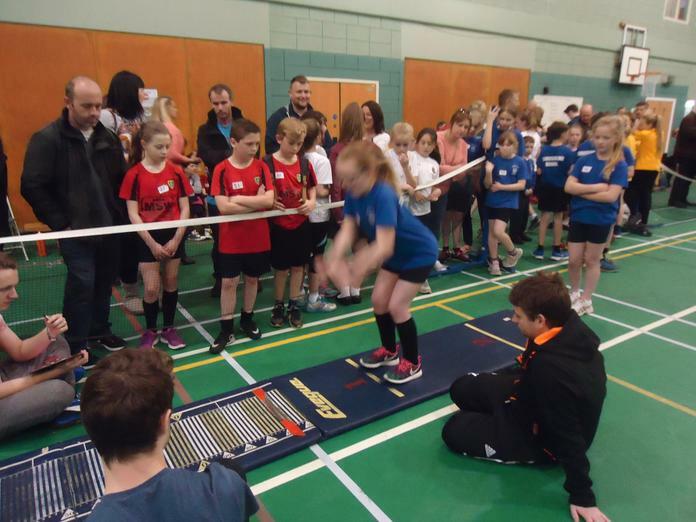 Latest indoor athletics tables - it's getting tight! Our victorious B Team sporting their new kit!! 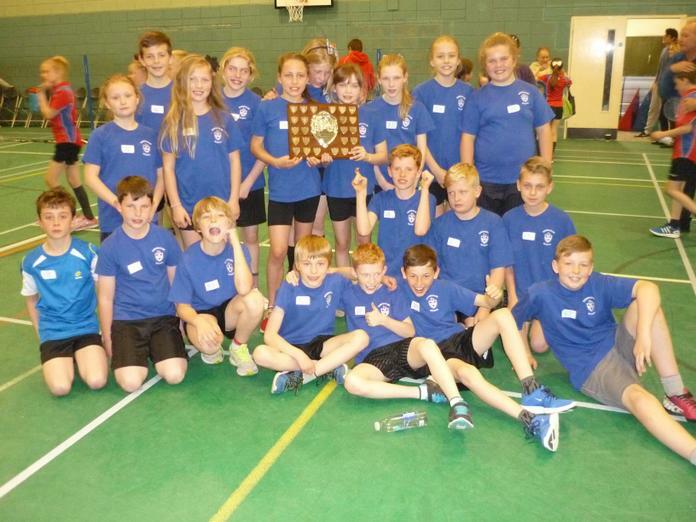 In a year of sporting success, Torrisholme continued to surpass expectations by winning the outdoor athletics tournament at Salt Ayre. 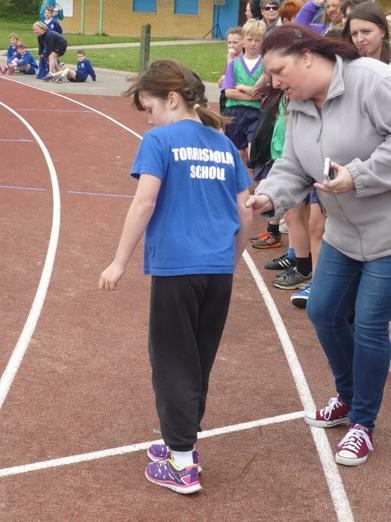 Having gradually improved over the past 4 years, Torrisholme smashed the 100 points barrier, finishing 1st with a mammoth 133 points. 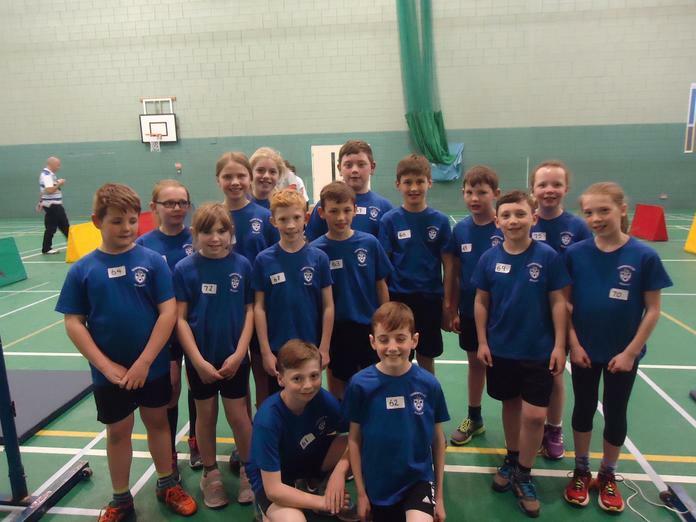 In the field events, Rebecca won the Y5/6 throwing, Georgie came second in the Y5/6 long jump, his brother Ollie was 2nd in the Y3/4 throw, Hayden was 4th in the Y3/4 long jump, Jamie was 6th, Rosie was 8th in the Y5/6 long jump and Lexie was 8th in the Y3/4 throw. This gave Torrisholme a solid start but nobody could predict what was going to happen. A great effort from Sasha, Amelie, Elysha and Rebecca saw the girls’ relay team breeze through their heat. The boys followed suit with Matty, Hayden, Ethan and Georgie leading the way. 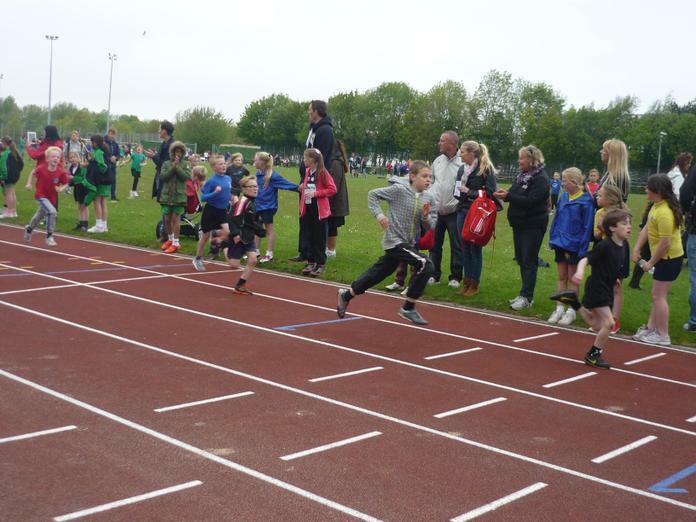 The excitement began with a wonderful win for Amelie in the Y3/4 400m. 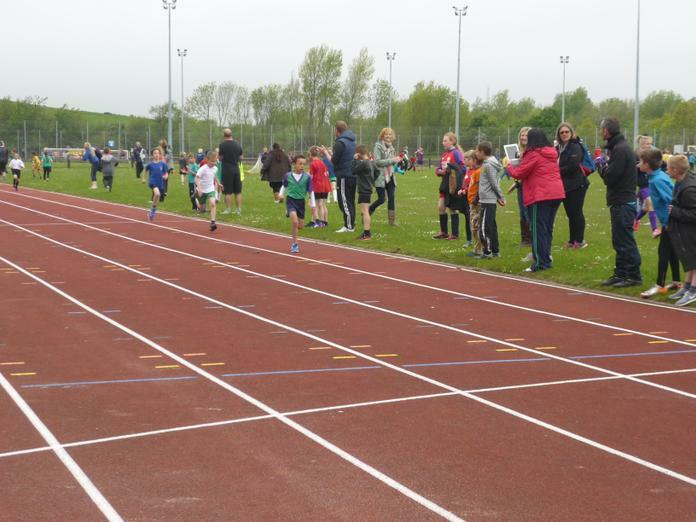 Toby followed this up with a victory of his own in the Y3/4 400m and Lucas then destroyed the field with a great victory in the Y5/6 800m. 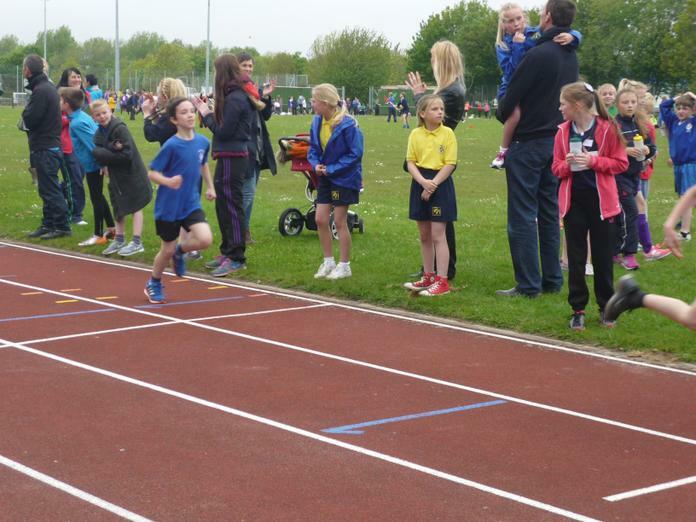 IN a high class race, Eve more than held her own to finish 4th in the Y5/6 400m. 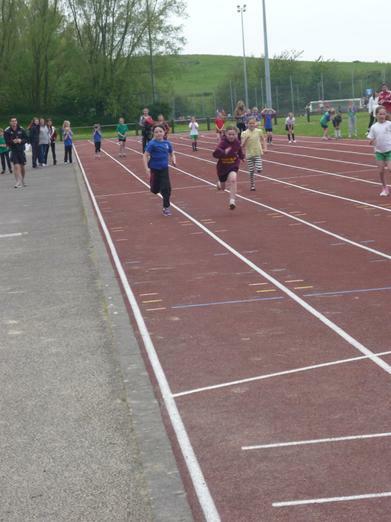 Torrisholme’s Achilles heal is usually not getting enough children into the sprint finals. They rectified that this year with a vengeance; 10 children out of a possible 15 qualifying for the finals! As well as this, Matty and Kenzie finished 5th in their heats, Ethan was 4th, Jamie 5th and Ella 5th, all picking up vital points. 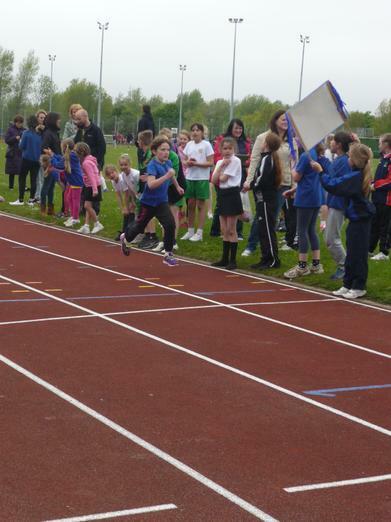 In the Y3 girls’ final, Sasha flew over the line in 1st place with Emily 7th. 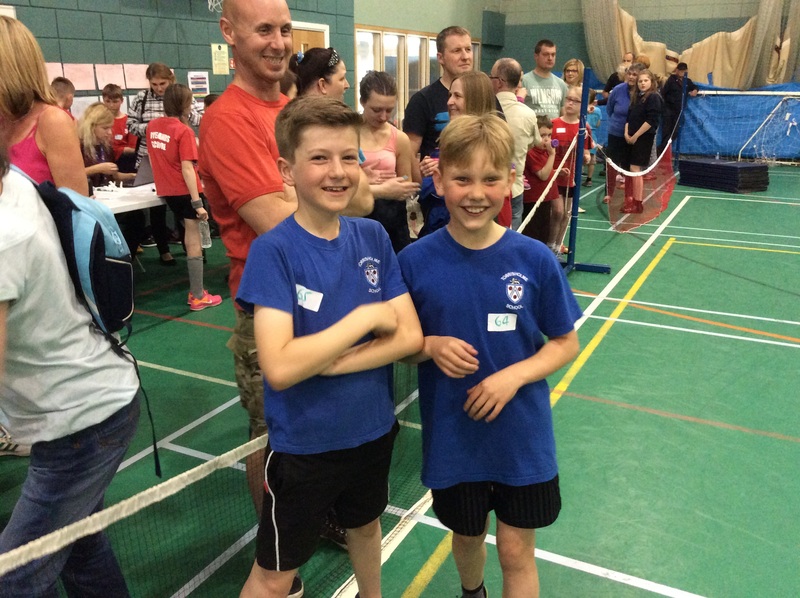 In the Y4 final, Hayden pipped Ollie to 3rd place with Ollie finishing 4th. 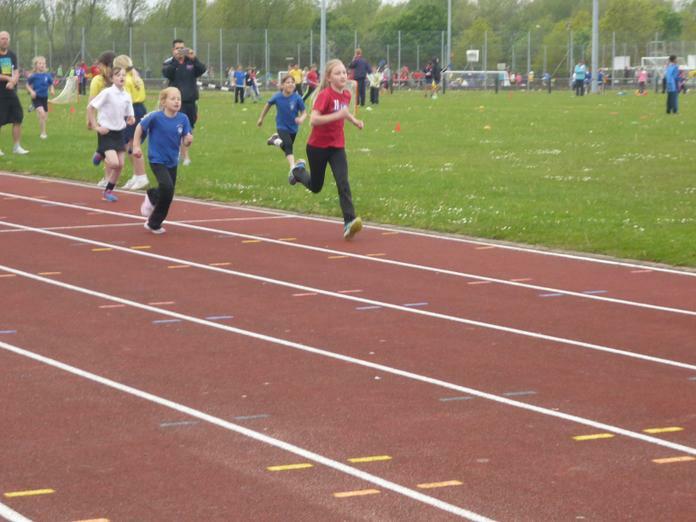 Elysha finished 4th in the Y5 girls final with Olivia 7th. 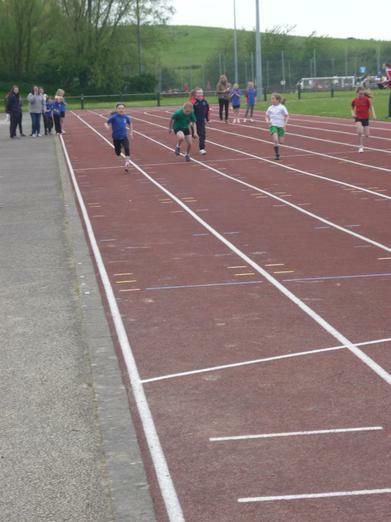 Georgie won a tightly fought race in the Y6 boys’ final with Jack flying home in 5th. 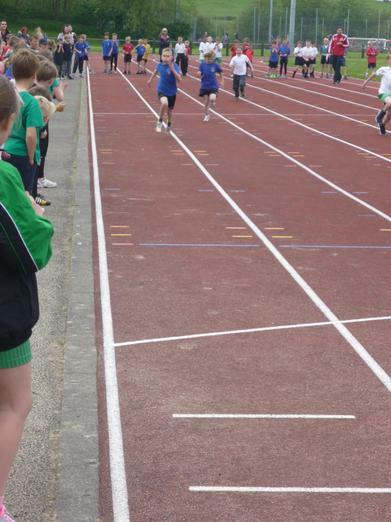 In the girls’ relay final, the sight of the baton on the floor, along with Amelie could have spelt disaster. 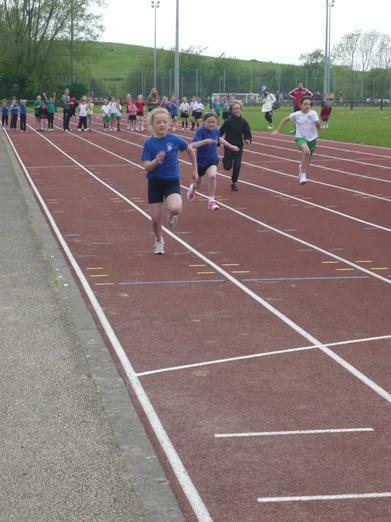 However, Amelie bravely jumped to her feet, with the baton, and sprinted off, enabling Torrisholme to finish 4th. 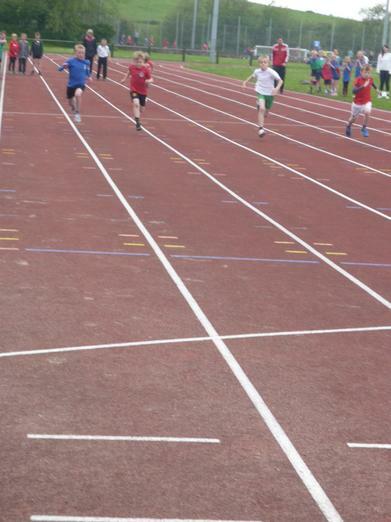 The boys’ relay team flew round the track, handing over smoothly to finish 1st and pick up big points. In the final reckoning, every single point picked up by each child was important. Well done to all on an historic victory. Check out the giant trophy in the cabinet at the front of school!